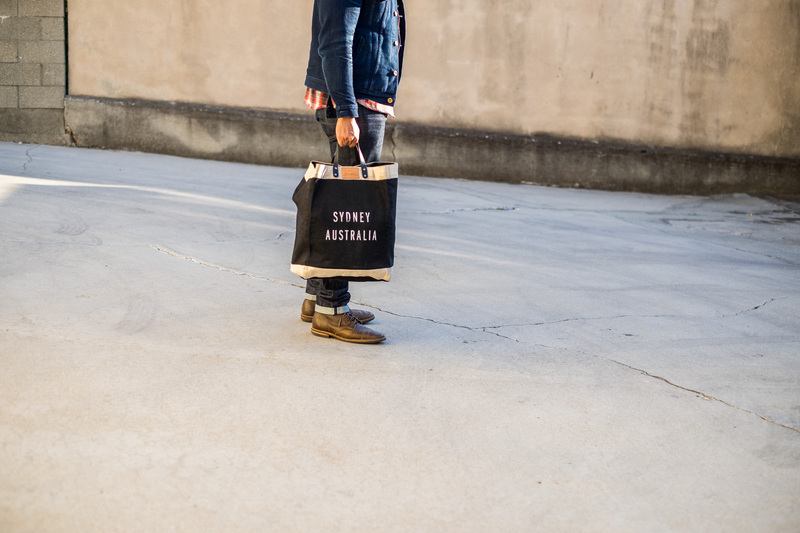 If you want a bag between a briefcase and a backpack in formality, a tote bag might just fit the bill for you. 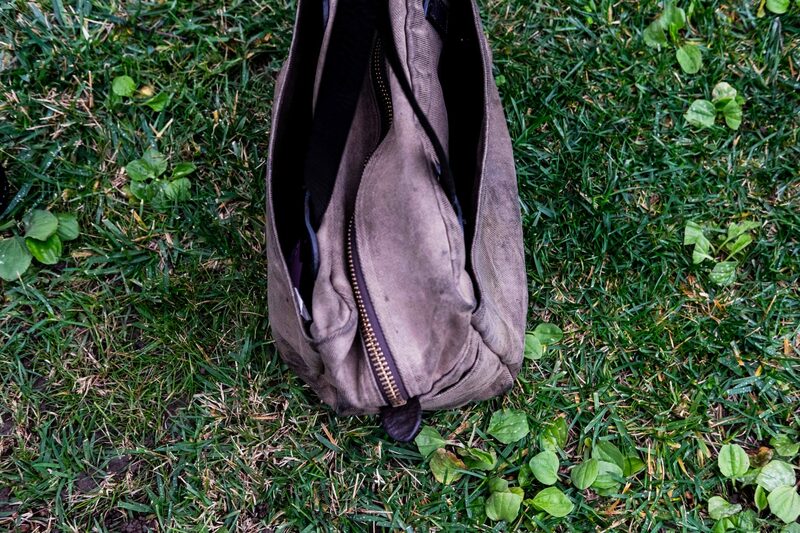 One of Vermilyea Pelle’s staple products in their catalog is the Day Bag. This will be my third review of a VP bag with previous two being the briefcase and the weekender bag. Their Day Bag is a bit of a hidden gem product in their catalog as most guys stumble upon VP because of their briefcases. When I’m heading out to do some errands, a briefcase might be a bit much in formality especially if I’m not bringing my laptop. 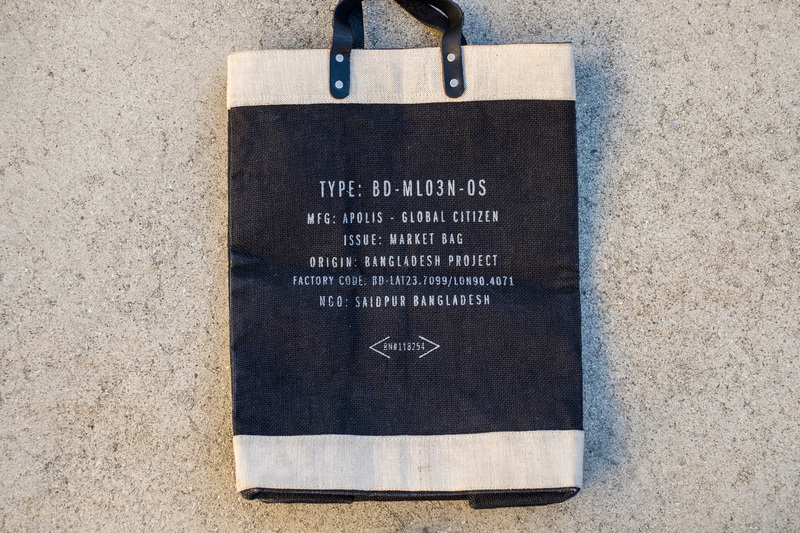 You might have seen women carrying their ubiquitous nylon tote bags in a multitude of colors. Likewise, I too want a casual bag that I can throw everything into. The design of the day bag is quite simple – a one compartment tote shaped bag with a zippered opening. On the exterior is one small pocket. Even though the design is simple, the superb quality of materials and craftsmanship into the bag is what I’ll be focusing about. I ordered this bag from Dustin in June 2016. At the time this specific makeup wasn’t listed on his site. He posted a picture of this bag on Instagram, and I asked him if he could also construct one with the same specs for me. It took around 2 months for the bag to be shipped which was a bit more than the typical few weeks lead time. 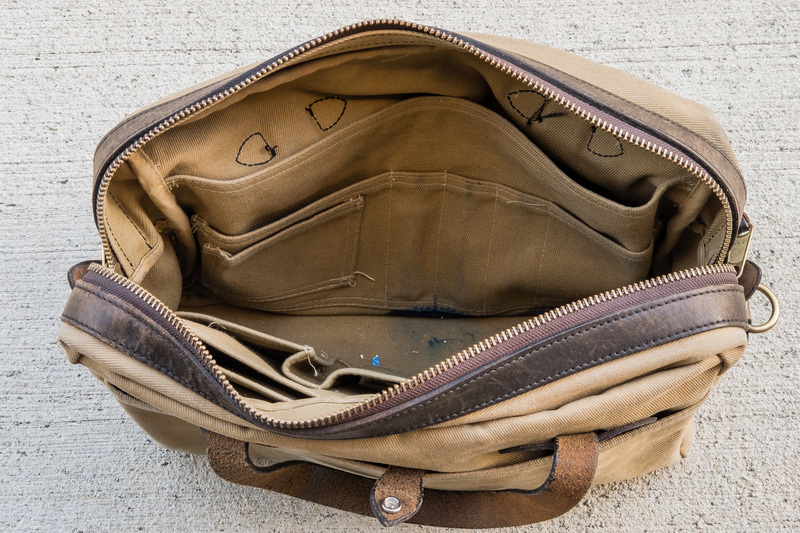 The only other regularly stocked Day Bag makeups I had seen available were an unwaxed Duck Canvas/Chromexcel or Ranger Tan Waxed Canvas/Chromexcel. Two months prior to ordering this bag, I purchased a Day Bag made for North and South Knives (the sold listing is surprisingly still up!). I contacted NSK and was told that the particular bag was a one-off made for them. One connection I can make is that after I received my first VP bag, the briefcase, every next purchase from VP after had one material in common. 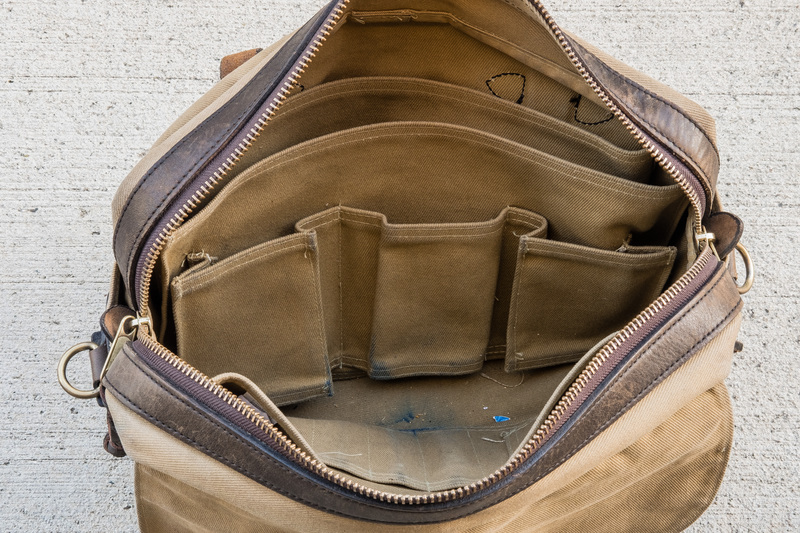 In this example, the Day Bag from NSK also was made of Ranger Tan Waxed Canvas like my briefcase, but with a Mohawk Snuff Suede leather instead. I liked the style of the day bag, and when I found out an olive 37oz waxed canvas one was potentially available, I knew I had to get that one! (Olive is my favorite color). The Ranger Tan Day Bag eventually was given to my now ex-girlfriend. 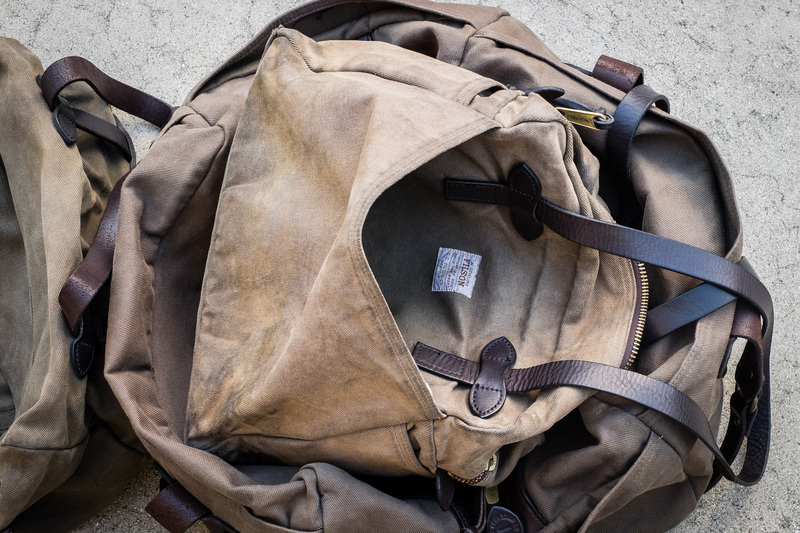 The Ranger Tan Waxed Canvas/Snuff Mohawk Day Bag a few days after I received it. For VP’s all leather bags, they offer rolled handles instead of the regular flat handles which is more comfortable (that’s why many women handbags have them! ), but you lose the option of the added handgrip. The Day Bag is the only style that does not come with an attached handgrip even though it has flat handles, but I think it fits the design well. 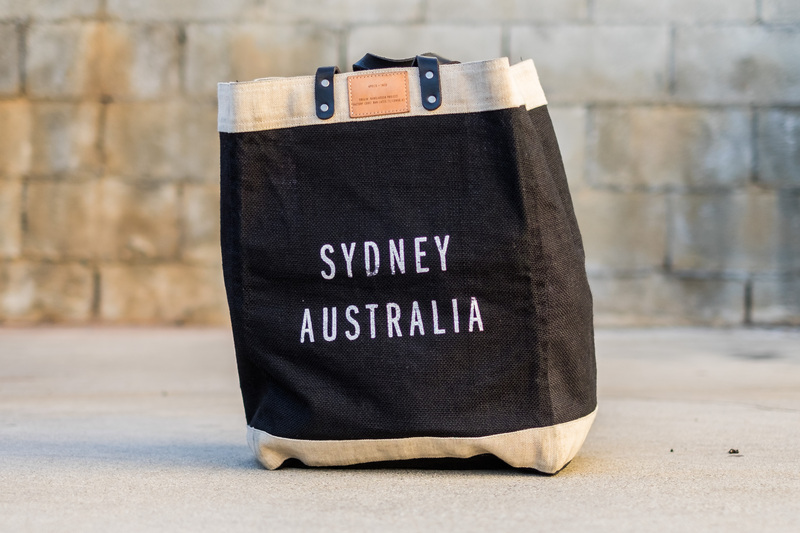 The handles are short and unlike female styled tote bags that can be carried over the shoulder, these ones are only long enough to be carried by hand. 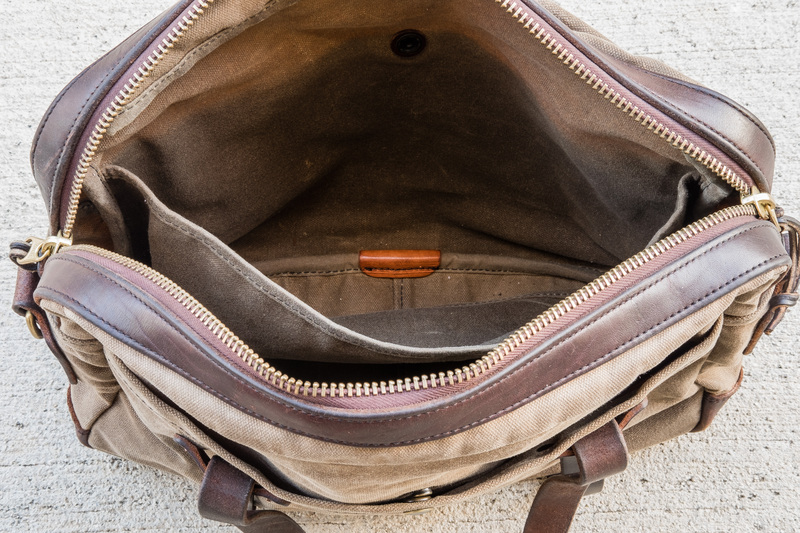 The day bag is completely unstructured and tends to collapse if it is empty. The waxed 37oz canvas started off quite rigid but softened up quickly as the wax wore off. 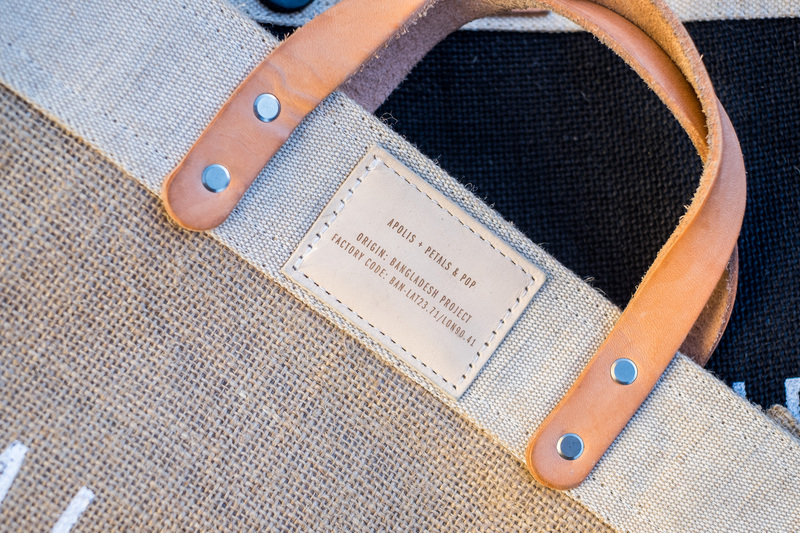 On VP’s brand new bags made in the 37oz Heavy Olive Waxed Canvas, you can see that the material is so thoroughly waxed that the canvas shows creasing. The wax on mine has definitely worn off to reveal a lighter olive color underneath! The Snuff Mohawk leather is my first experience CF Stead’s Tannery which is based in England. 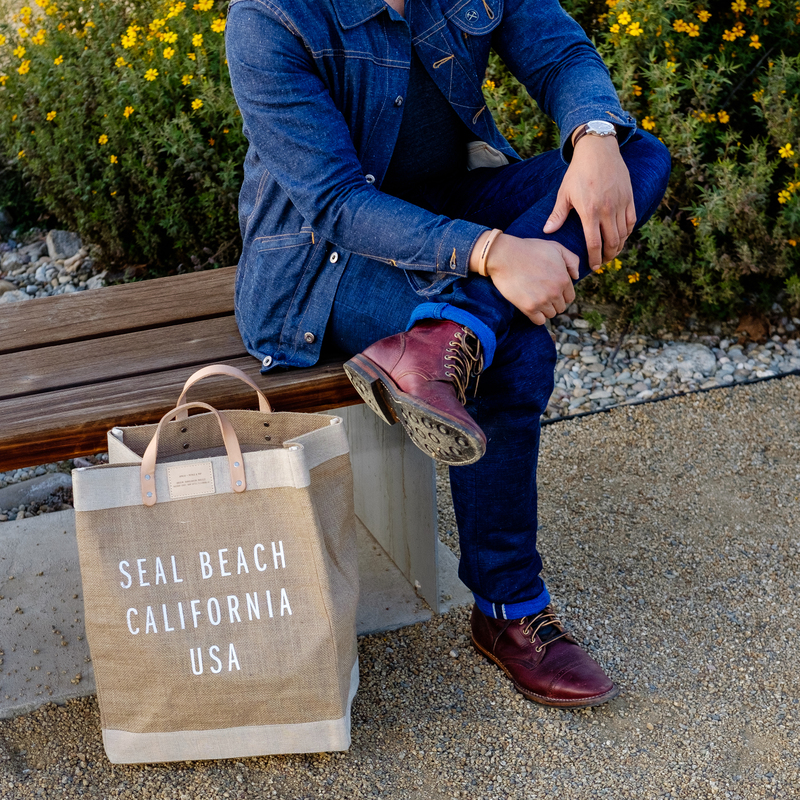 CF Stead is known for their suede leather and is used today in well known shoe companies such as Clark’s Originals, Truman Boots, Allen Edmonds, and Wolverine. From other pics of their leather I’ve seen online, their suede isn’t a typical soft consistent suede. They embrace the hide’s marks, scratches, and scars, and they are definitely renowned for that. On my Day Bag, the Snuff Mohawk is used as the bottom exterior, the side pocket, the handles, and the strap. The Snuff Mohawk is definitely reminds me of roughout leather in terms of its durability and water resilience. It feels a bit waxy and thick. Unlike the VP briefcase whose zipper opening is supported by two parallel, robust leather strips, the day bag does not have that feature. Instead, the zipper is surrounded by just canvas. This tends to make the bag open flop it a bit. 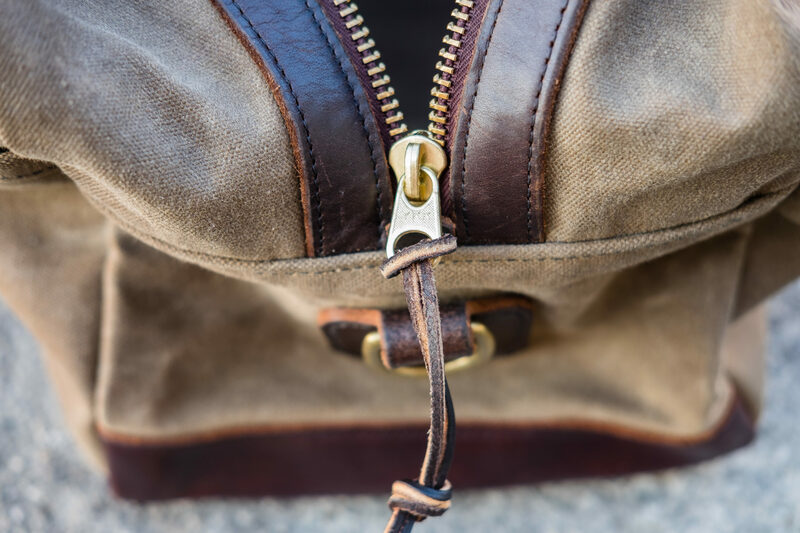 The coolest and my favorite feature on the bag is at the ends of the zipper where there is a Snuff Mohawk leather pull tab reinforced by 4 brass rivets. You can grab onto this tab with your other hand to help stabilize the zipper movement with your other hand. I like this detail of the bag and wished the briefcase had longer pull tabs. 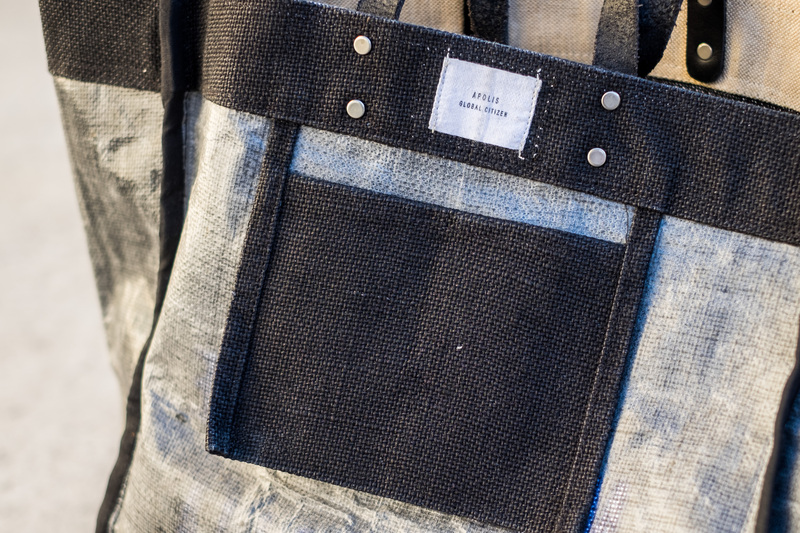 One one side of the bag, there is a midsized pocket leather pocket attached to the canvas. The corners are reinforced by brass rivets. I can’t seem to find much use for this pocket as it’s too small to put documents in and too unsecured to place my phone in. I either wish the pocket was both longer and deeper, had a zippered closure, and/or was on the interior instead. 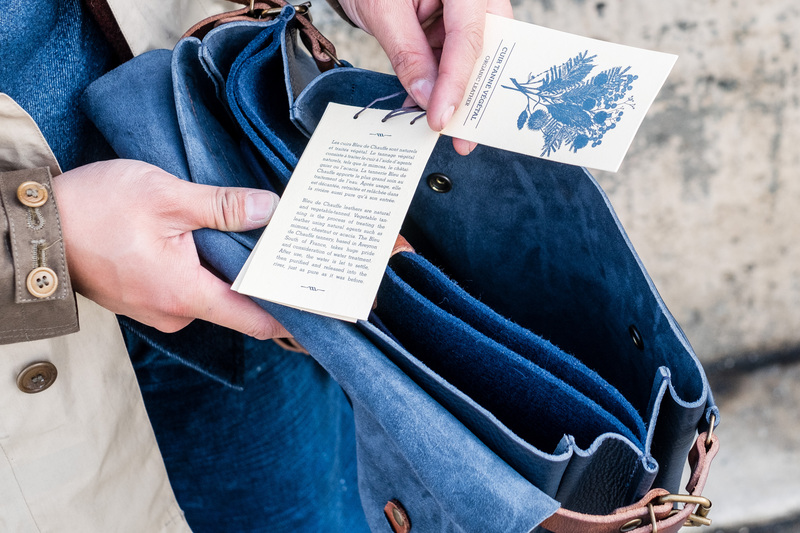 The interior bottom is lined with soft deerhide leather. I’ve spilled so many forms of liquid in this bag such as water and coffee, and the only the deer lining is still going strong. You can see stains of the liquid but it is only cosmetic. I’ve once spilled nearly a whole liter of water, and none of it penetrated through to the exterior bottom Snuff Mohawk Leather. That shows how well the Snuff Mohawk leather handles water! The strap attaches to the bag with a D ring on the opposite sides of the bag. What I noticed immediately is that the strap length is much longer than the briefcases’s even at its shortest hole length. I think the longer strap provides you the option of carrying it cross body. Here are some pictures of my Filson Small Duffle Bag 220 (or 70220 with Filson’s new numbering system) in Otter Green and a brief review of it. After purchasing my Filson Zippered Tote, I wanted another Filson bag that I could use on short trips and also as a gym bag. 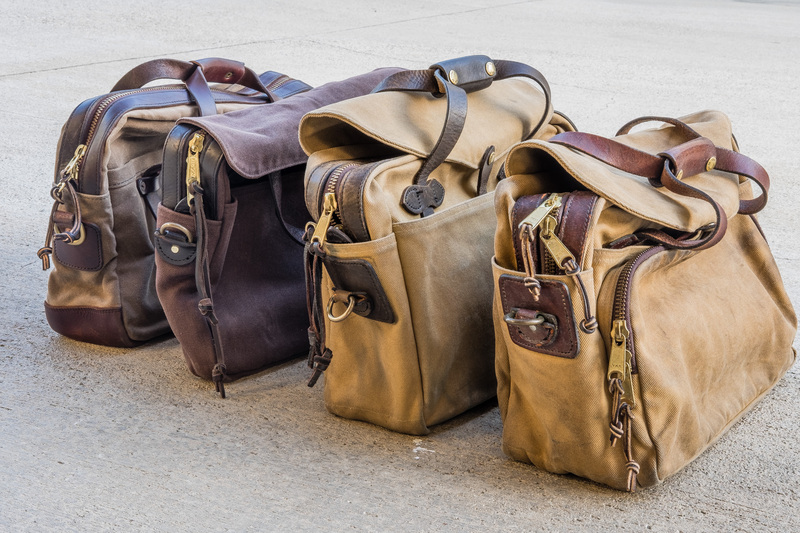 At that time in 2014, Filson had already discontinued the 246/248 which in my opinion were really well designed bags. The Travel Bags had 4 outer pockets (2 lengthwise and 2 widthwise) and one large empty compartment. Between the Sportsman and Small Duffle, I decided on the Duffle because of the simpler design and lesser price. I was able to get the bag on sale. I’ve had the small Duffle since 2014, and have used it primarily as a gym bag for about 2 of those years since 2014. Therefore, the bag has roughed up on the floor quite often! The color started out as a dark forest green and lightened up to a a grey likely from sunlight and rain. The bag was very stiff and rigid to start with. Early on, I took the empty bag, essentially crumpled it up into a ball, and repeated multiple times. I also applied Obenauf’s Leather Oil to the bridle leather. The oil was not needed for conditioning purposes, but in hopes that it would soften the leather, and it did! One of the reasons it’s an attractive bag is that it meets carry on restrictions, and of course it looks nice. It is large enough to hold about a weekend’s worth of clothes. 18″ x 11″ x 10″ = 39 total linear inches, meets most carry on restrictions which is typically less than or equal to 45 inches. The duffle is shaped like a trapezoid, tapering slightly as you go up. I think the duffle bag looks great when filled up, but not so great when near empty. The major gripe I have with this bag is the single layer twill cotton bottom. 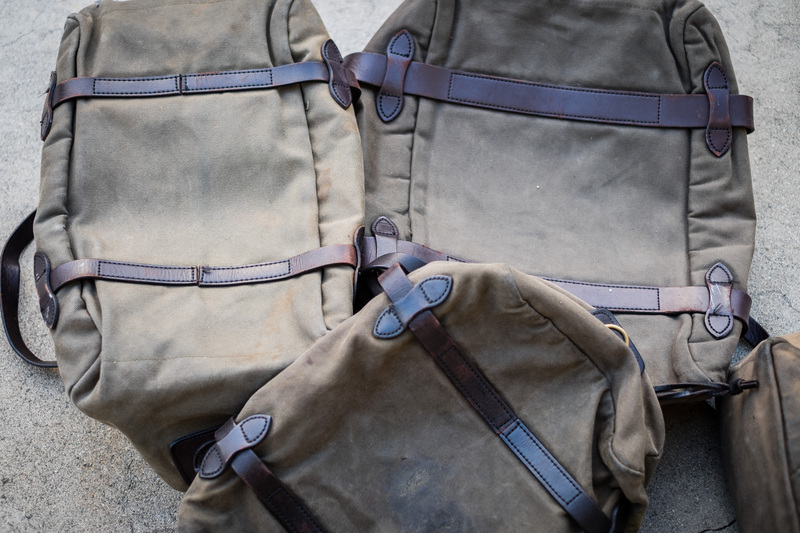 All of my other Filson bags including the briefcases, totes, field bags, sportsman have a two layer bottom. Filson Small Duffle Bag next to Vermilyea Pelle’s Weekender Duffle Bag. Slight curvature in the VP bag opening makes it easier to access. 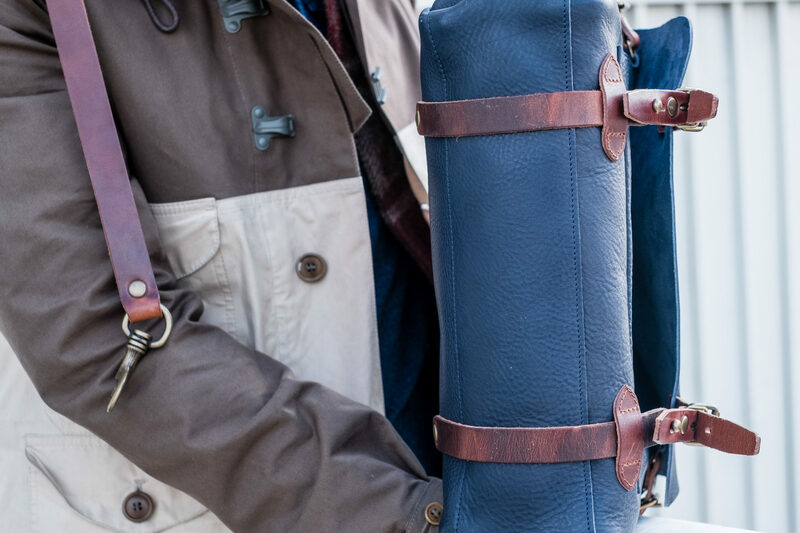 The duffle design has no exterior pockets. Storm flap to prevent the elements from getting your stuff wet! A snag on the side that was sewn up by my Mom. 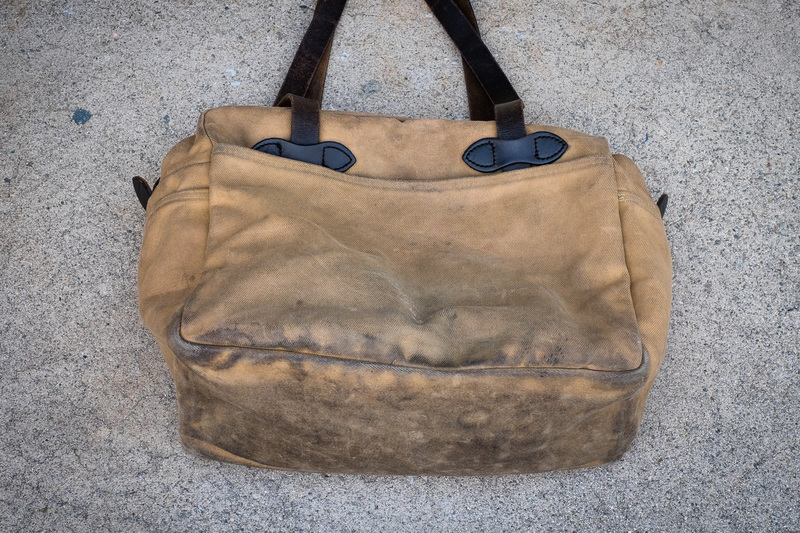 This repair is similar to how bags come back repaired from Filson’s Restoration Department. 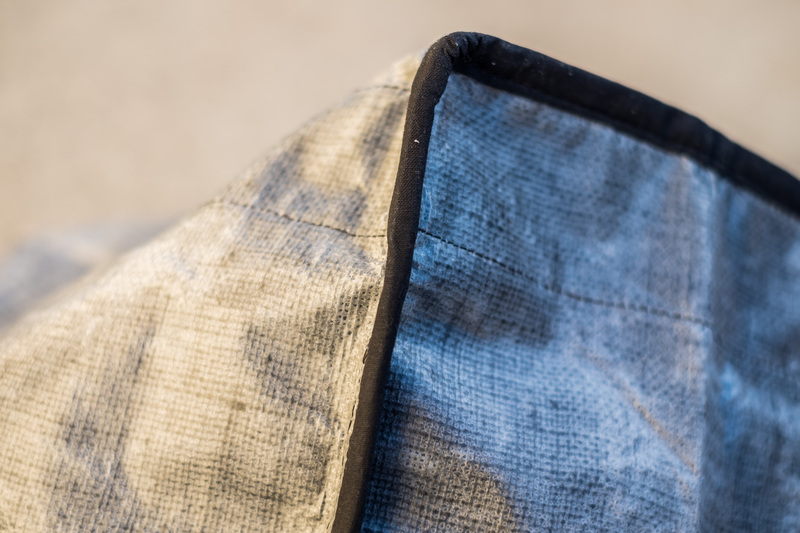 The storm flap is the only part of the bag that is two layers of twill thick. The bag flipped upside down. 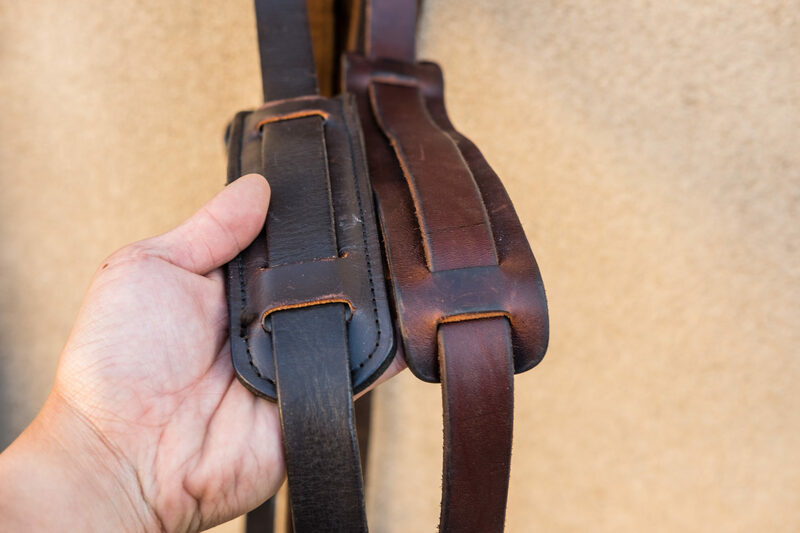 Filson’s double bridle leather stitched in parallel to the zipper. Bag turned inside out. One of the interior end pockets in Tin Cloth and the manufacturing date label. Also, the interior seams are bound with tin cloth for extra protection against the elements. This particular bag was manufactured January 2013, and I purchased it in 2014. The other interior end pocket in Tin Cloth when the bag is turned inside out. I don’t use these pockets because they’re too far in when the bag is filled. The bottom bridle leather has held up well to scuffs. The twill, however, needed some more sewing repairs. I spot waxed the particular areas with Filson’s Original Wax for more durability. The bag when empty essentially lacks any structure. It is due to both the cotton twill softening and also that the bag is only one layer throughout (except for the storm flap). 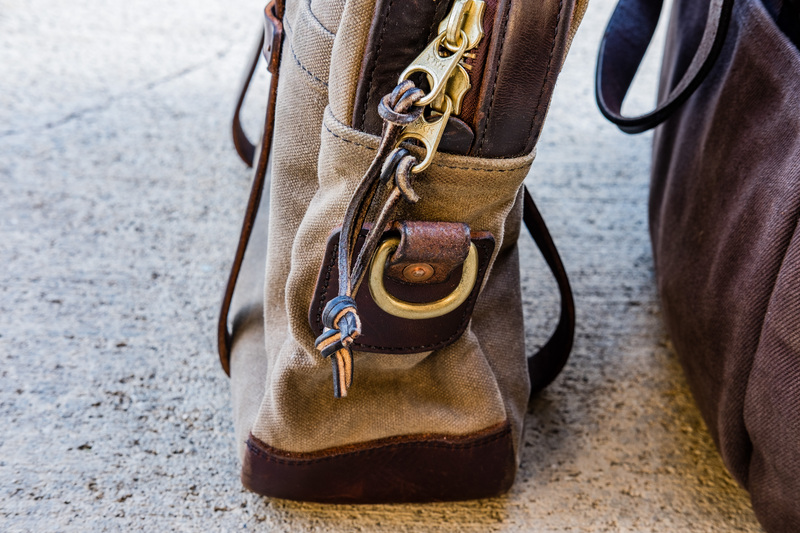 The bridle leather zipper pull that comes with the bag makes it very easy to blindlessly grab. 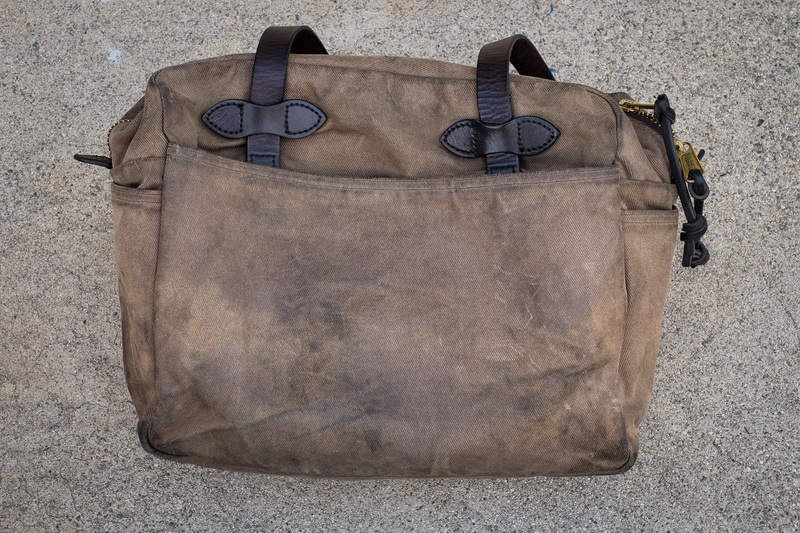 The Filson Small Duffle packed about 3/4th full carried on the shoulder strap. A reference for the bag’s size. I am 5’10” and holding the duffle by its handles. It’s neither overly big or small. Filson uses bar tacks at stress points such as the edges of this storm flap. How the D rings are attached to the bag. 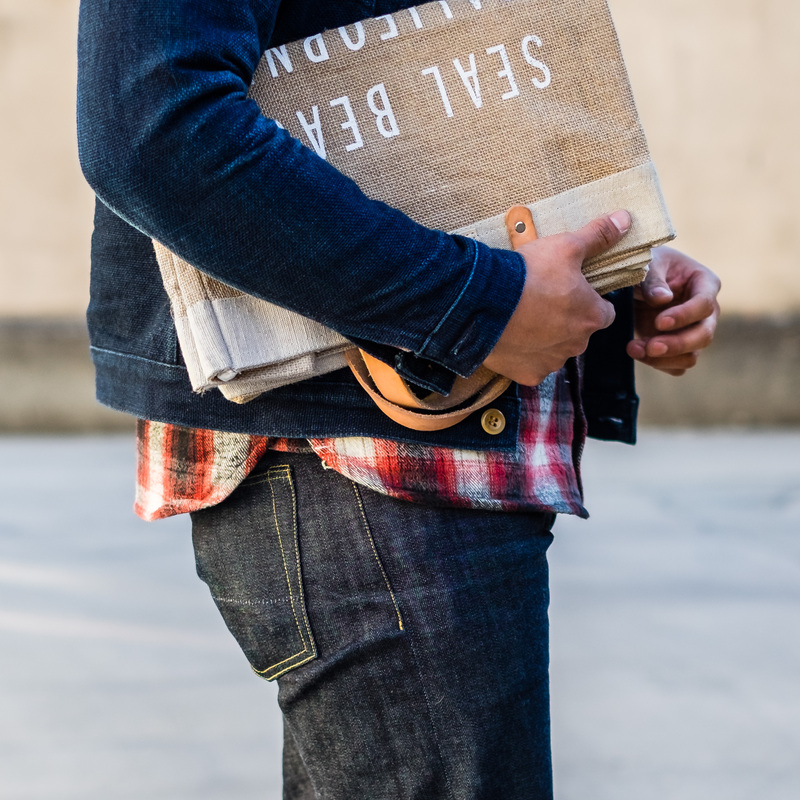 Indigo rub off from your denim is likely the first sign of patina you’ll see! The last bag in my collection is the Bleu de Chauffe Eclair M in a “navy blue/pain brûlé” colorway. 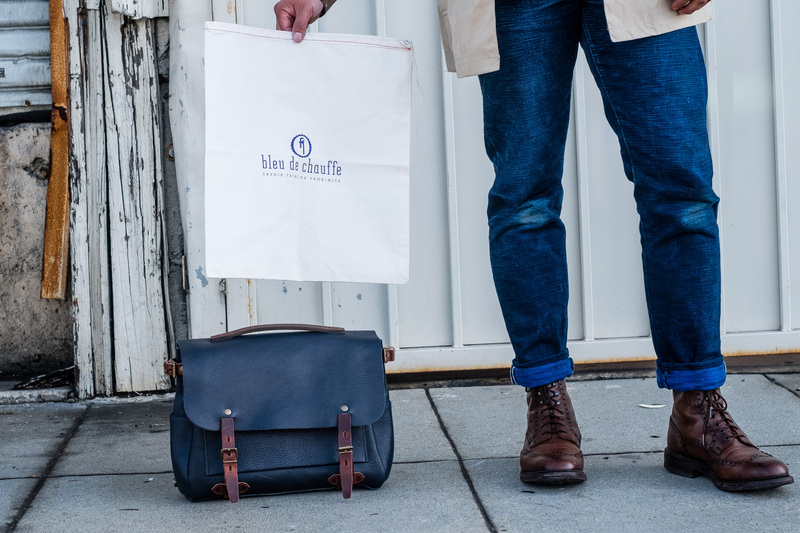 I’ve seen a handful of these Bleu de Chauffe bags from my fellow friends on Instagram, and they look absolutely gorgeous! 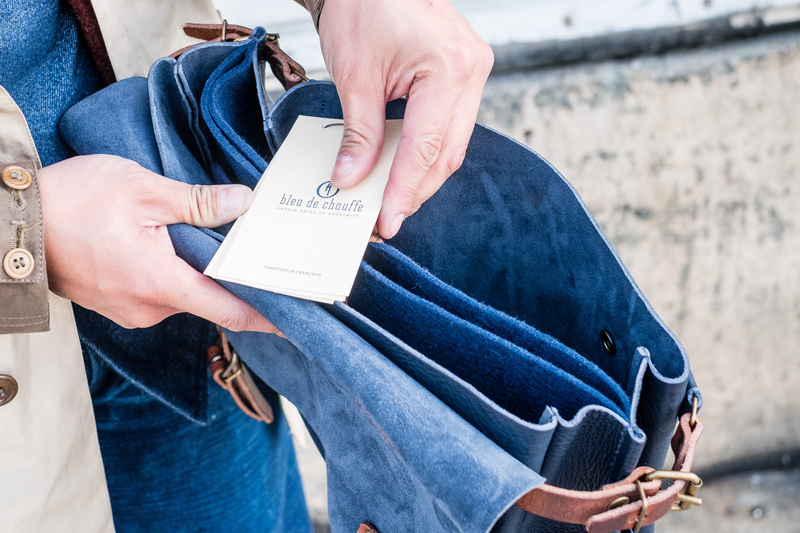 Bleu de Chauffe uses full vegetable tanned leather instead of chrome tanned. 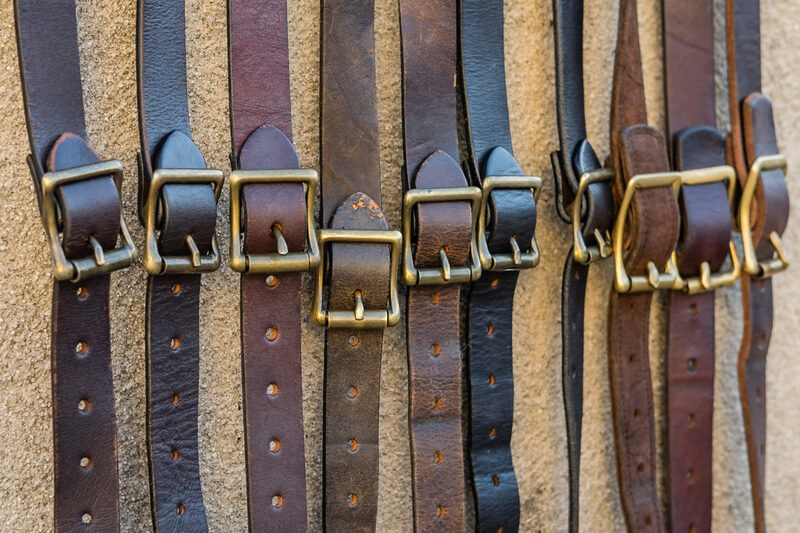 Some of the primary differences between the two types of leather is that veg tan will acquire a distinct patina, is not water resistant, and may crack to prolonged exposure to heat or dryness. Chrome tanned leather remains fairly uniform in color, is softer and suppler, and do not show as much fiber variation due to the tannage. Bleu de Chauffe takes its inspiration from late 19th and early 20th century design. Besides the plastic wrap, the bag included the previous mentioned cards and also a cotton material Dust Bag that was folded in the interior of the bag. -Shoulder strap bag made of vegetable tanned leather. -Very convenient thanks to its quick openning system, the Eclair bag can be either hand or shoulder carried. -The leather strap can be removed if needed. -Three outside pockets including. Integrated felt sleeve for 13 inches laptops. 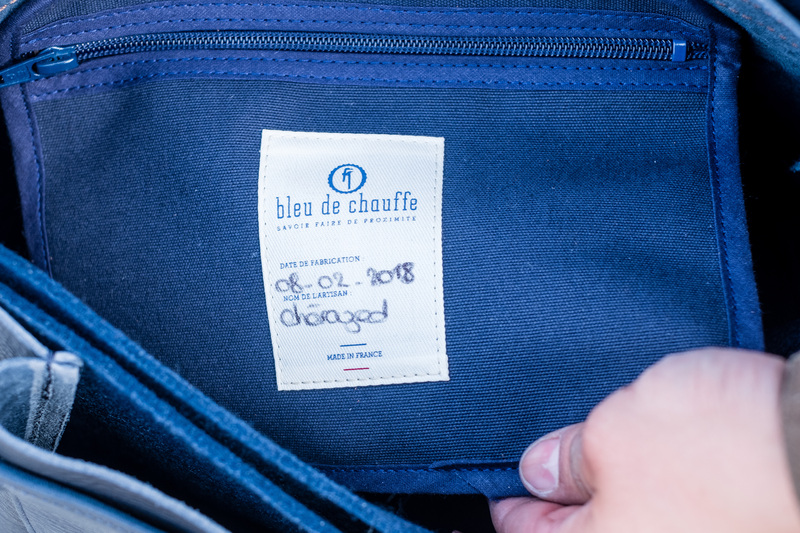 -The Bleu de Chauffe label, signed and dated by the artisan, is sewn on an inside zipped pocket. Today, more than 90% of leathers in the world are tanned by chrome tanning and heavy chemical components. Bleu de Chauffe’s approach is different. 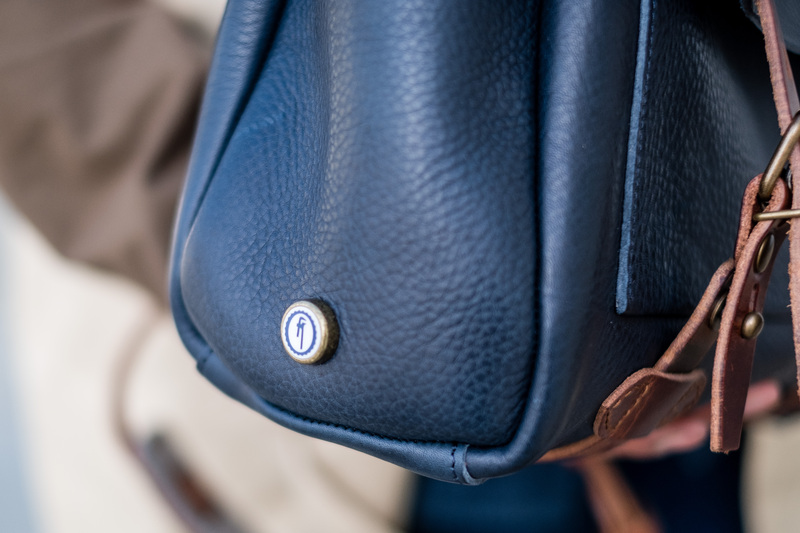 Our leathers are vegetable tanned which ensure a better quality and sustainability of the leather, a soft natural touch, and a patina which gets nicer years over years. – Full grained leather. Vegetable tanned and water resistant. – Natural and soft touch finish. Handmade patina. – Backside leather with ‘velvet’ finishing. – Removable leather strap and comfortable leather shoulder pad lined with natural felt. – Leather handle for comfortable hand carriage. 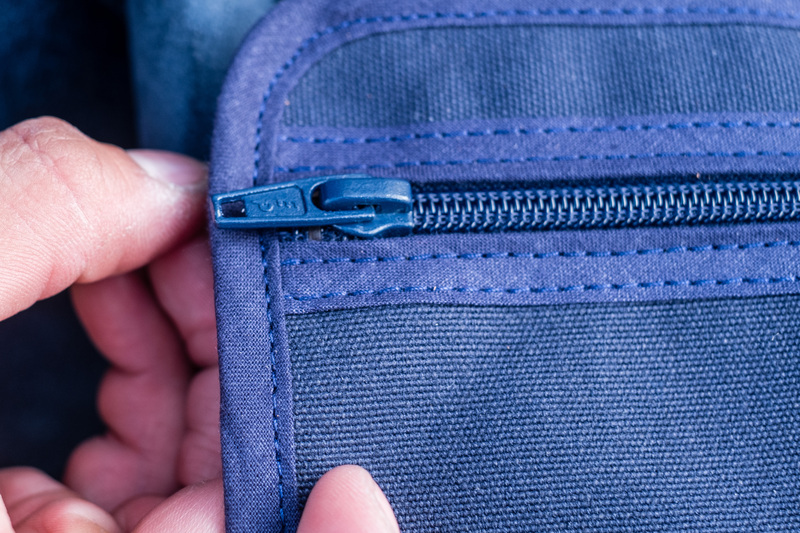 – Inside removable zipped cotton pockegnature. – Suitable for 13 inches laptop. When I received the shipping notification, the bag took 10 business days via USPS from France to arrive. Upon opening the box, the bag was fit almost perfectly into the dimensions of the box and was wrapped with a clear plastic. There was a small flip booklet attached to the handle by string. The booklet described the history of the company, its values, and the construction details. Upon opening the bag, the leather didn’t smell like Chromexcel or other leather I’ve handled before. It took me a couple days to figure out that the smell reminded me of a rubber handball or rubber kitchen gloves. It’s neither a repulsive nor attractive smell, but is quite interesting. 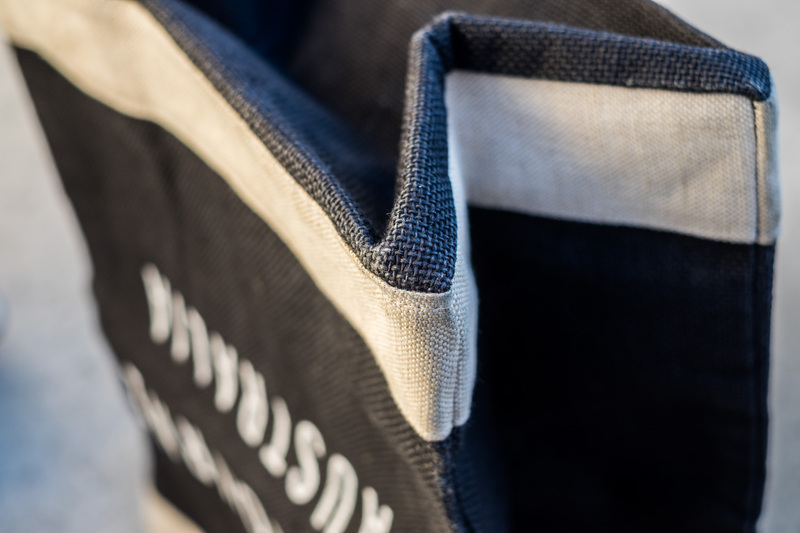 The bag’s construction is stitched so essentially all the seams are on the inside of the bag, providing a clean look. I haven’t had a full leather bag since I sold my Saddleback Leather Dark Coffee Brown Large Briefcase because it was too heavy. 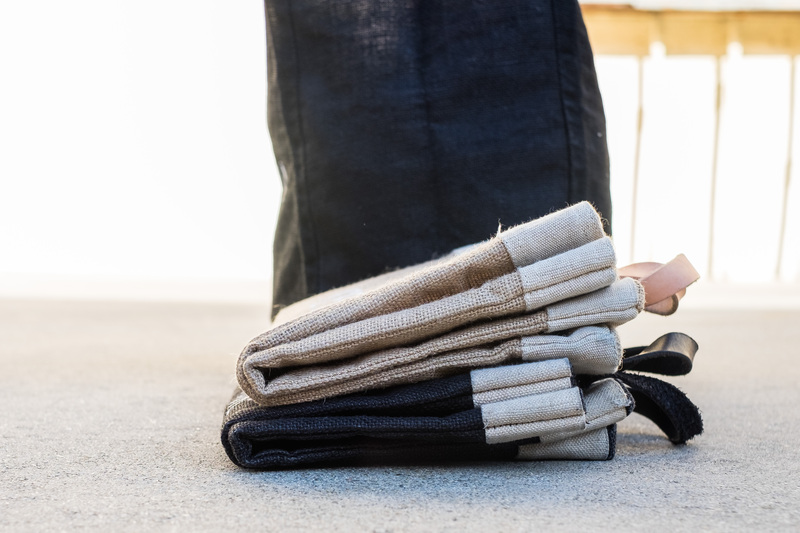 The Eclair’s material is completely vegetable tanned leather except for two places – the removable zippered canvas-like pouch and the center compartment’s felt sleeve. I suppose then it isn’t truly a full leather bag! This bag is flawless in construction. I searched everywhere on the bag to find any missed stitches or extra thread dangling, but found none! It’s a remarkably constructed bag, and I’m amazed at how reasonably priced the bag is. 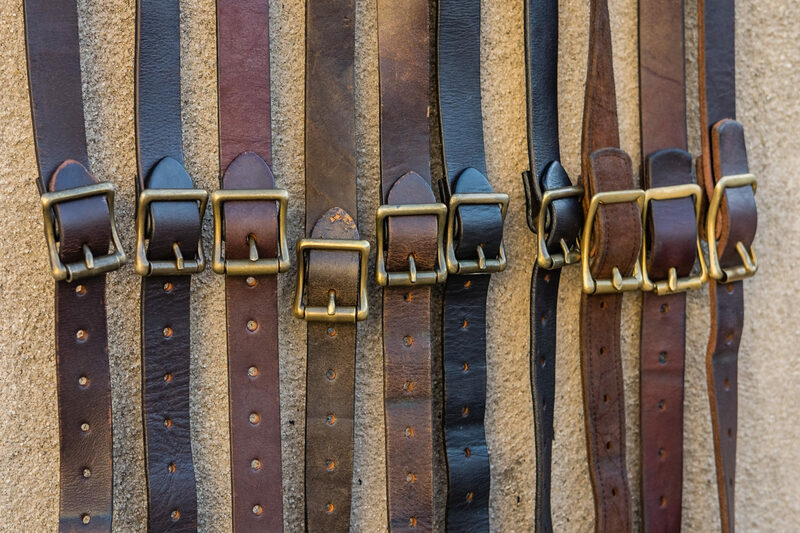 The pain brule leather used on the straps and closure is very thick and exhibits pull-up leather properties. 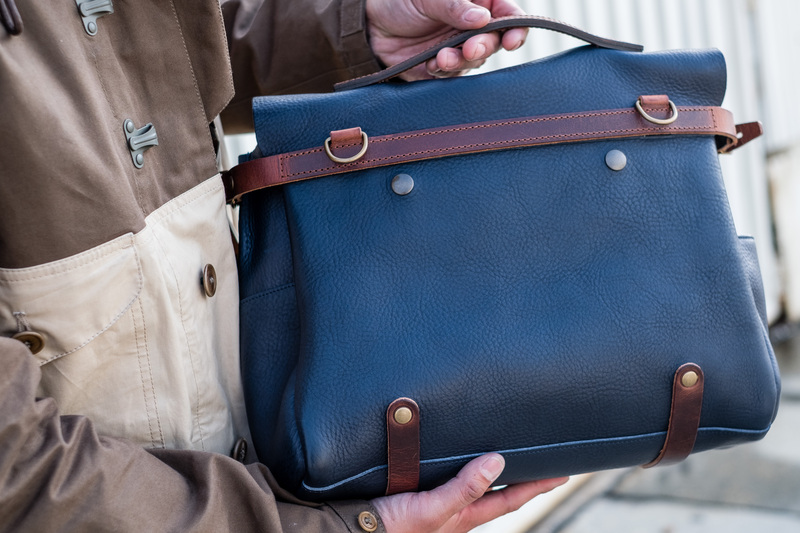 The navy blue leather has a scotch grain appearance and the other side of the leather exhibits a smooth navy suede. My 15 inch Dell laptop does not fit in any of the compartments including the felted laptop sleeve. 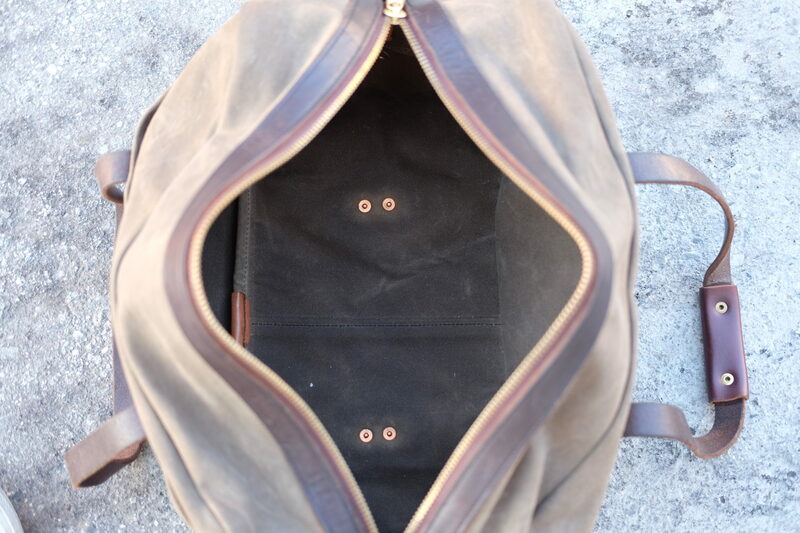 The laptop felt is so soft and is slightly thicker than the laptop sleeve in my Tanner Goods Wilderness Rucksack. On the top of the laptop sleeve is a snap leather closure to secure your laptop. This leather piece has two punched holes which is like the front closures but only is cosmetic to the design. 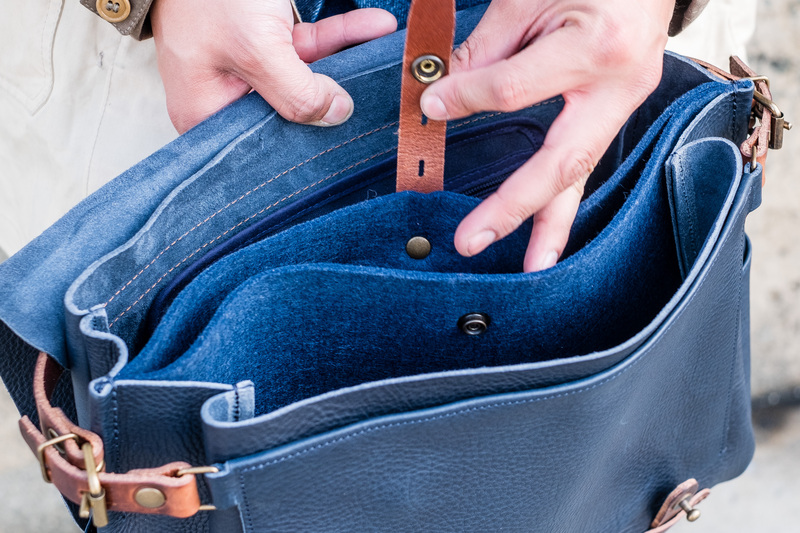 The bag has a total of 3 separate compartments (not including the laptop compartment), 1 laptop compartment in the middle, and one removable zippered pouch that is located in the innermost compartment to store smaller items. Although the description mentions 3 outer pockets, the only two outer pockets are the two quite narrow water bottle pockets. On one of these water bottle pockets is a brass cap that has the company’s logo – a small, neat addition! The last pocket is actually the outermost underneath the flap. 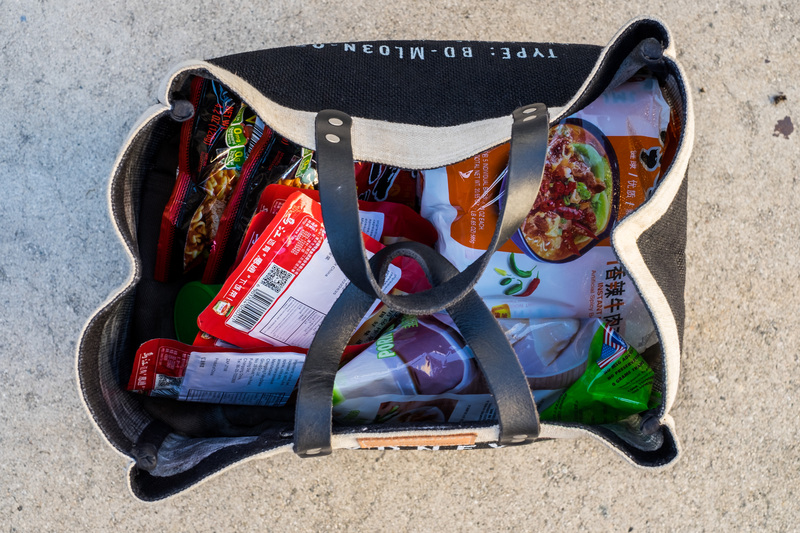 Therefore, the bag’s flap essentially must be opened to access any interior items. I like the bag’s closure because I can close and open the flaps with one hand. The leather closure has three potential lengths to cinch or loosen up the closure as needed. This design reminds me of Billingham camera bags which also have a one stud closure with an adjustable length closure. One issue that I have is that the flap leather closures hide behind the buckle straps so I have to make sure I’m grabbing the leather closure below to close the bag. 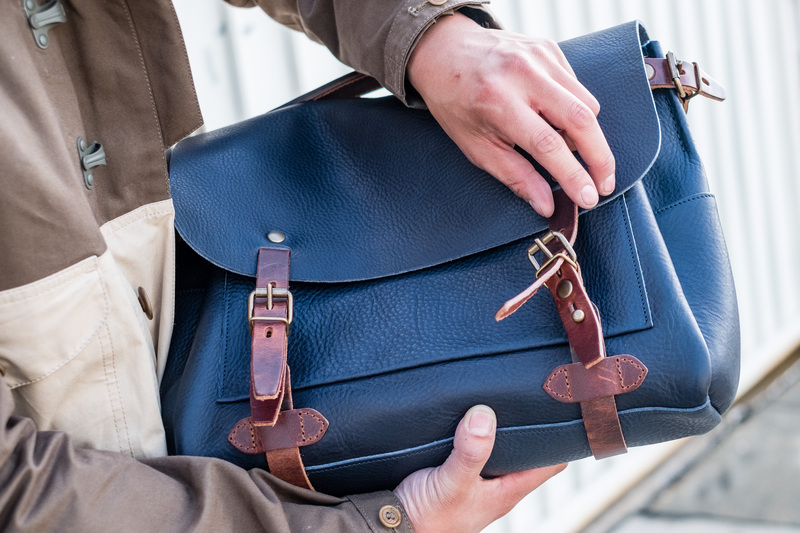 The Postman Eclair bag falls within the “Messenger bag” category of the brand’s website. The colorway I selected is called “navy blue/pain brûlé” in a size Medium. The other 4 colorways available were Indigo, Pain Brûlé (Tan leather with Brown closures), Peat (Dark Brown), and Black. All of these other colorways have a monochrome leather for the whole bag. The colorway I chose was the only one that provided a significant color contrast between the bag’s leather and the closure leather. 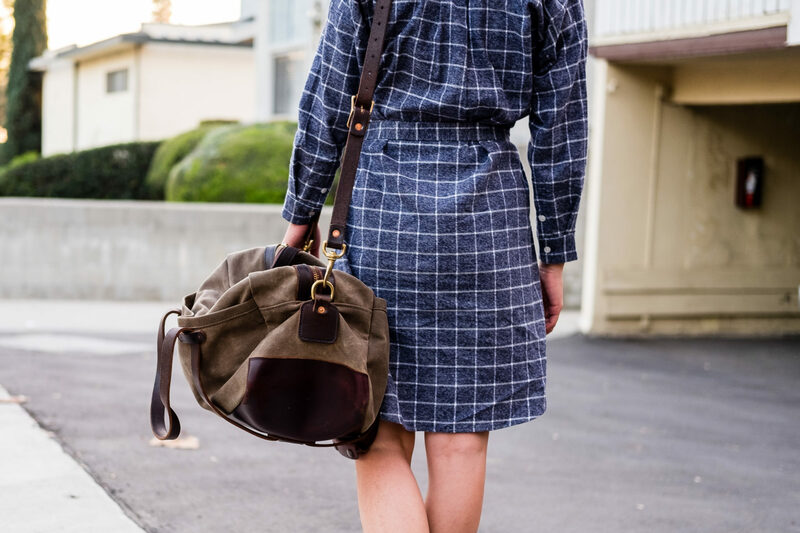 I initially wanted the Postman Eclair bag in a size Large because that bag additionally can be worn as a backpack with the additional straps. However, I was told that the Large design was soon changing. 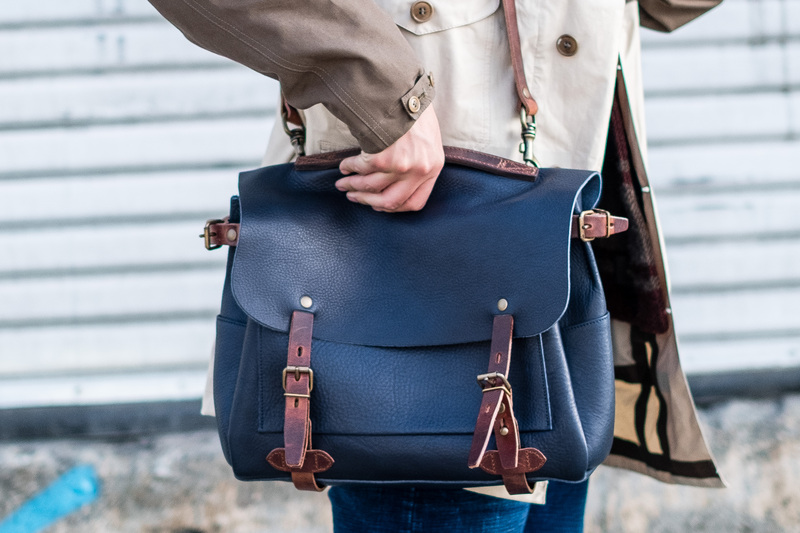 Additionally, the larger bag design compromises a traditional messenger bag because it most similarly resembles a square bag (34cm H x 36cm L). However, the size L bag description mentions it can store a 15 in laptop. 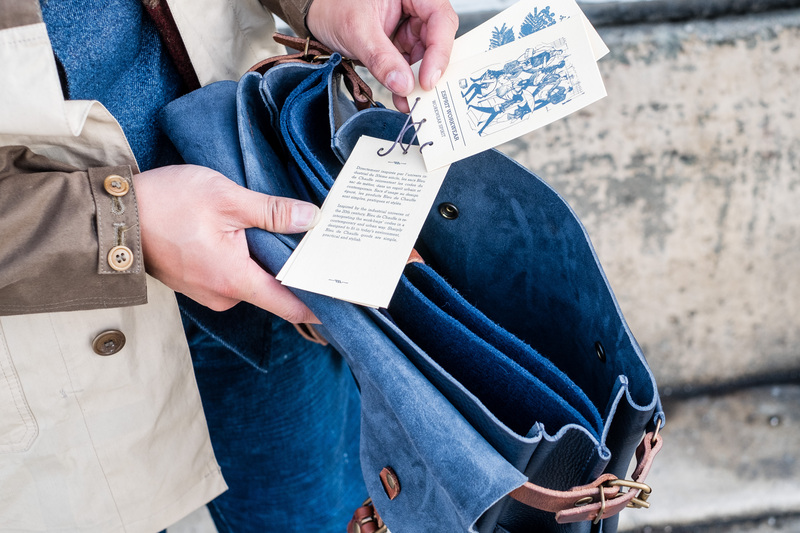 On each side of the bag, there is an adjustable leather strap that has two holes. One is to tighten the width for a smaller load and the other hole is for a larger load. Personally, even with the bag stuffed full, the “width” typically isn’t the limiting factor, but just the volume space. 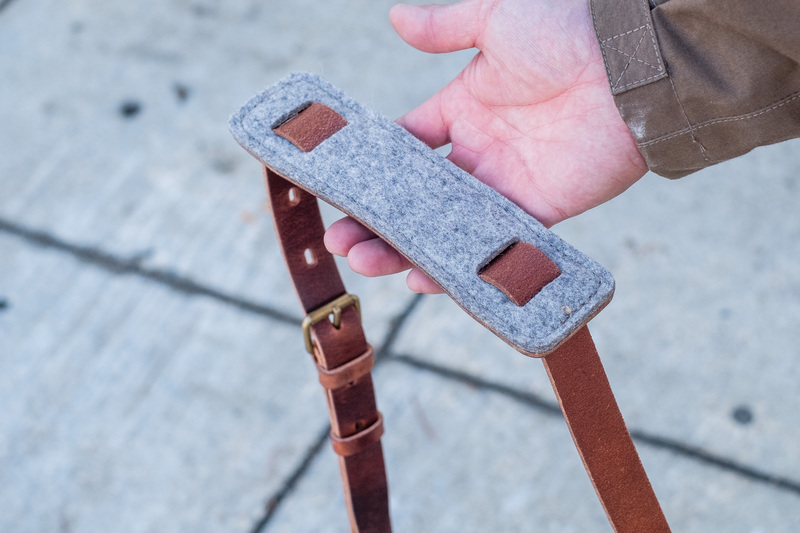 The shoulder strap is removable and comes with some sort of wool felted shoulder pad. 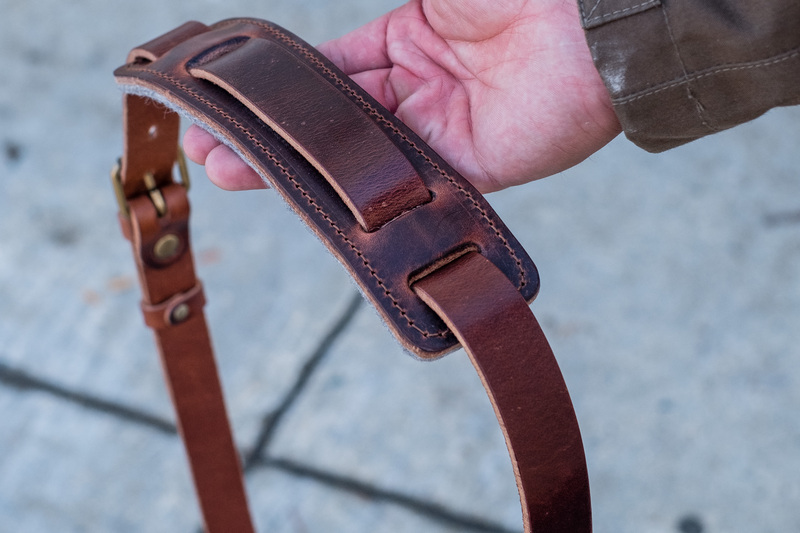 The maximum strap length is fairly short compared to a Filson bag. The length likely suggests that the bag is to be carried primarily on one shoulder side rather than cross body. There is also a removable zippered cotton pouch in the innermost compartment that is held to the bag by two button snaps. 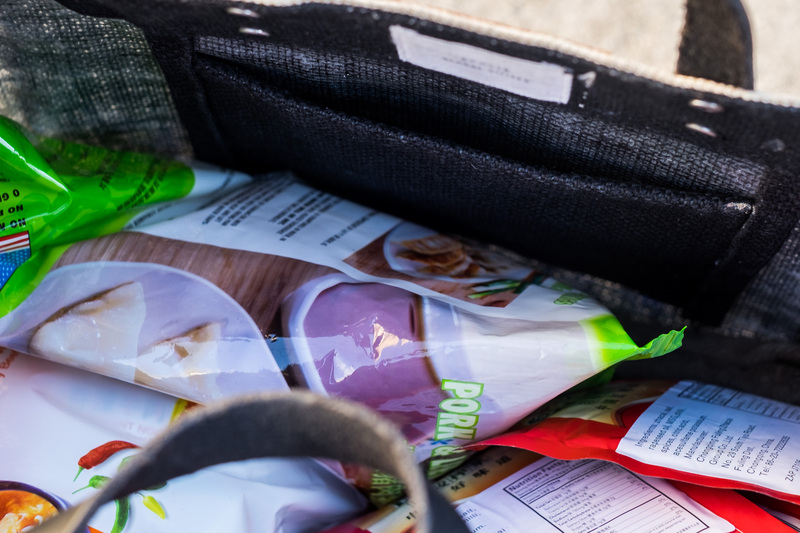 The pouch can be removed and snapped to the front compartment where there are also snaps. The pouch is quite small at about 9 inches x 6 inches. Looks like a great spot for your keys. Also sewn to this pouch is the company’s only written logo (besides the logo cap snap on the exterior). 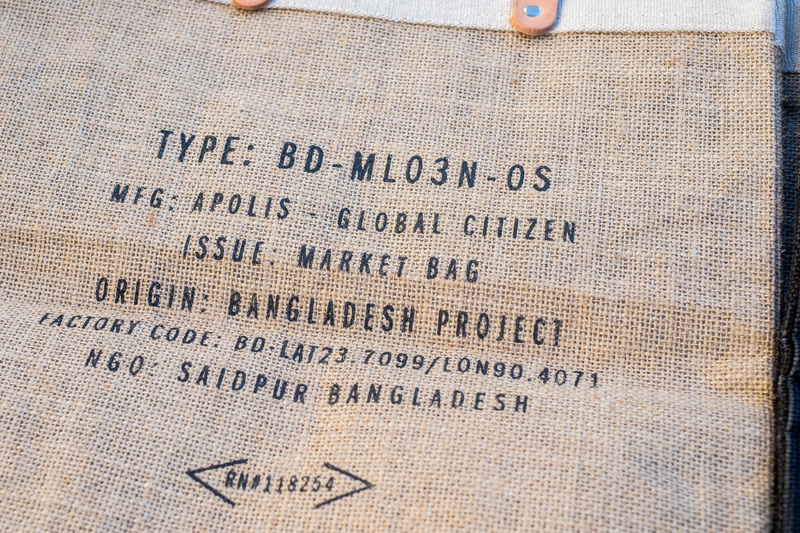 The tag also has a handwritten date manufactured and also the artisan’s name. My bag was manufactured on 02-08-2018 and by “Charazad” (?). 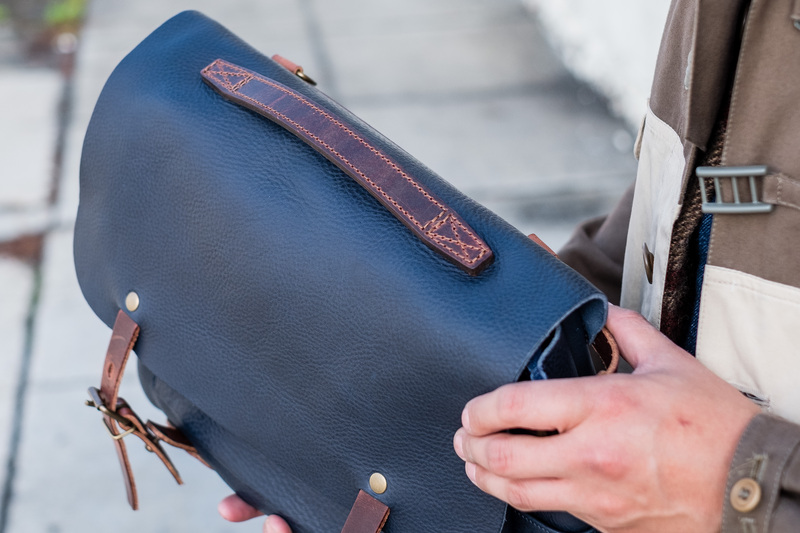 The Postman Eclair bag design is a combination of minimalism and authenticity. The quality of this bag is second to none, and as much as I would love to describe it, I think pictures do the bag more justice. I’m looking forward to how the bag will age and soften with time. The leather straps are already softening! While I wish the bag could fit my 15 inch laptop, I prefer the proportions of the Medium size to the Large. 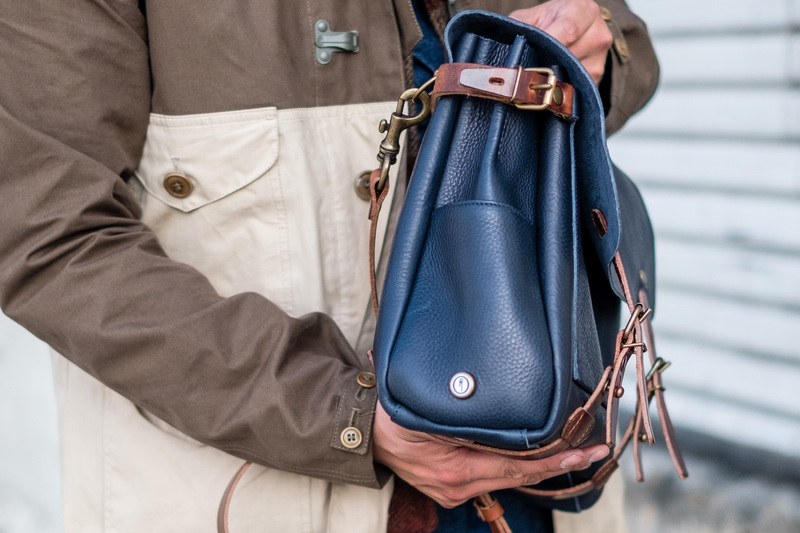 This is a bag that is timeless and exudes a refined look in contrast to my rugged Filson and Vermilyea Pelle bags! 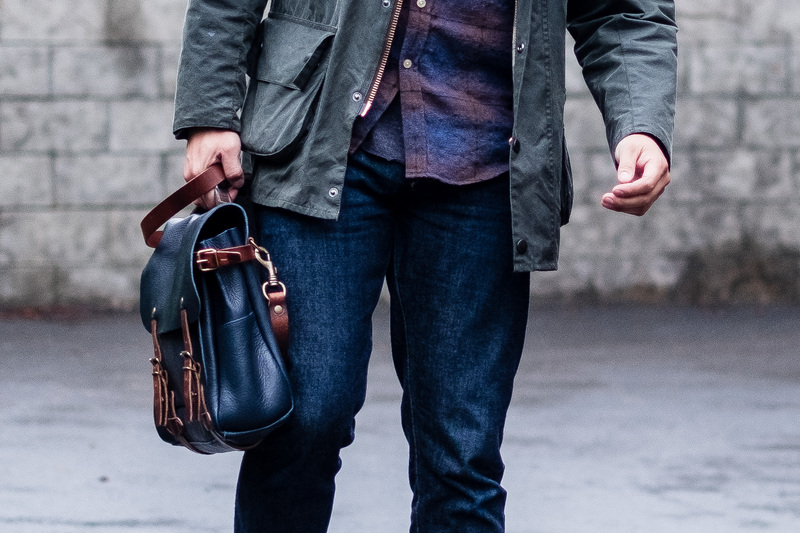 Should I get a Filson bag in Otter Green or Tan? 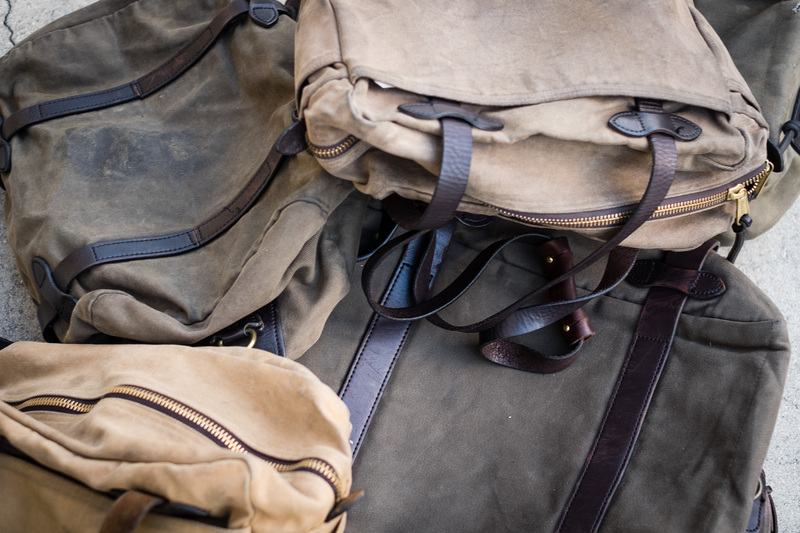 Filson’s first original colors were Otter Green and Tan. 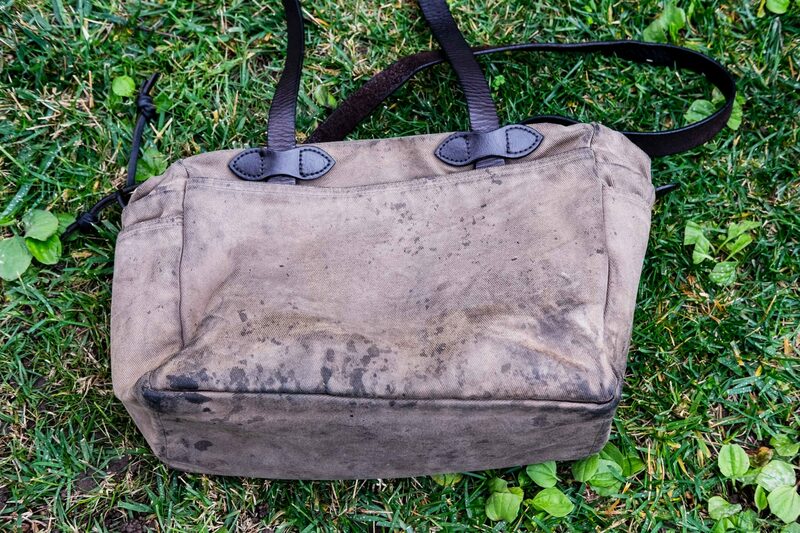 If you search for pics of some of the oldest, most worn, tattered Filson bags on Google, they were likely originally Otter Green and not Tan. I’ll support this claim later with some pics. 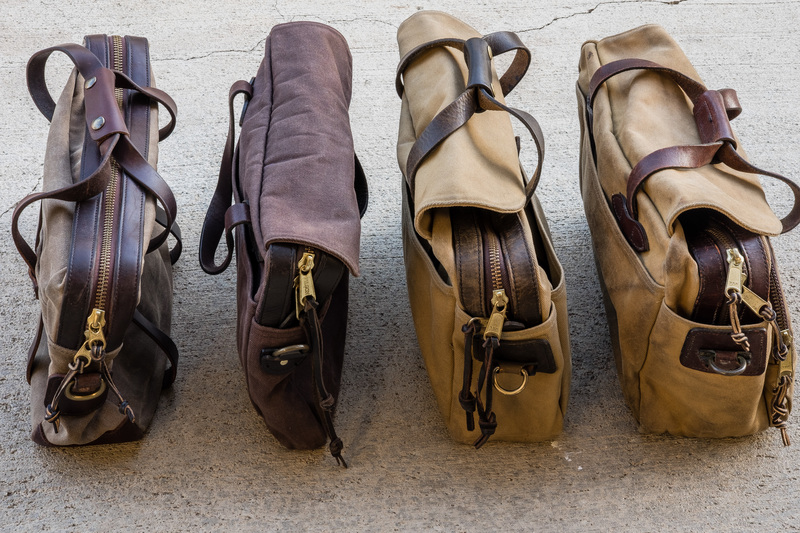 The associates who work at a Filson retail store will typically estimate they sell twice as many Tan bags as they do Otter Green bags. And sure enough, there are quite a number of convincing reasons why they do! 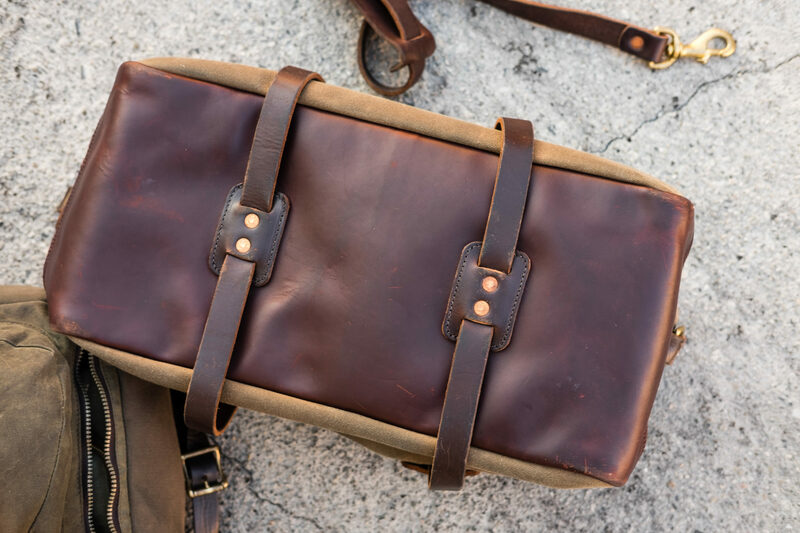 Tan is the classic Filson color and is likely how people recognize a Filson bag. 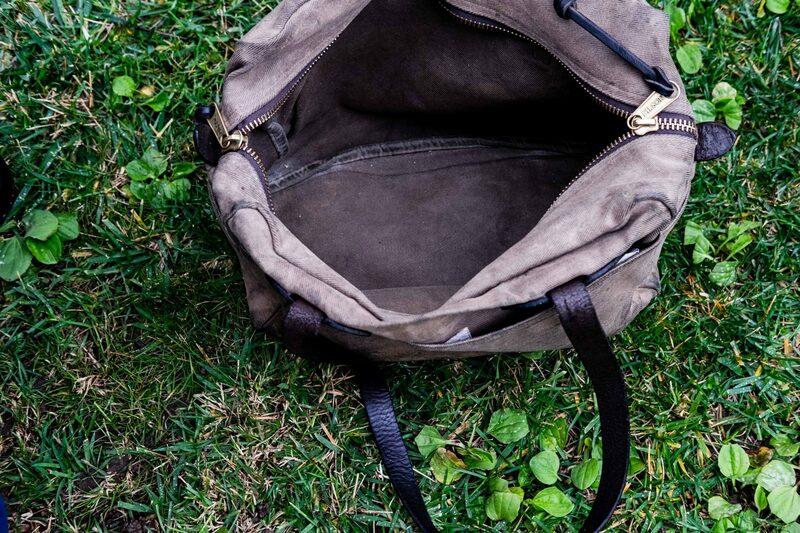 The contrasting brown bridle leather against the tan canvas really makes a bag “pop”. Also note that the color of the bridle leather stays the same regardless of canvas color. 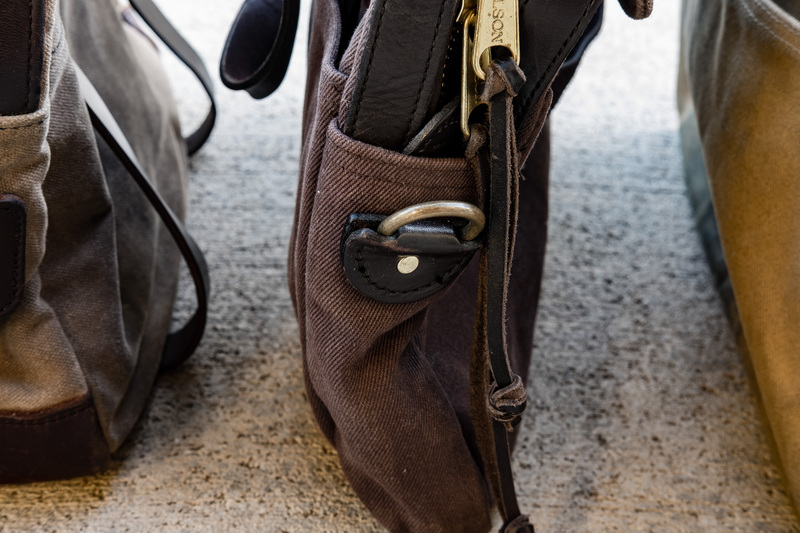 The contrast of Tan and the rich brown bridle leather is what makes a Filson bag iconic! As of ,now I’m at about a dozen plus Filson bags (I’m a bagoholic!). I guesstimate the distribution of colors is about 6 Otter Green, 5 Tan, 1 Black, and 1 Brown. I’m biased towards olive because it is also my favorite color in the menswear world. 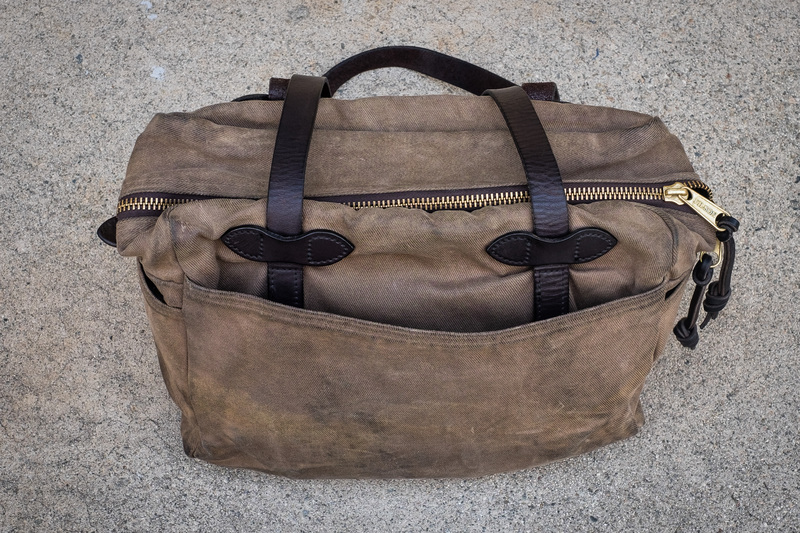 For further pics, check out my review on the Filson Zippered Tote. The way that Tan patinas is that it picks up dirt, indigo dye, and easily and darkens. 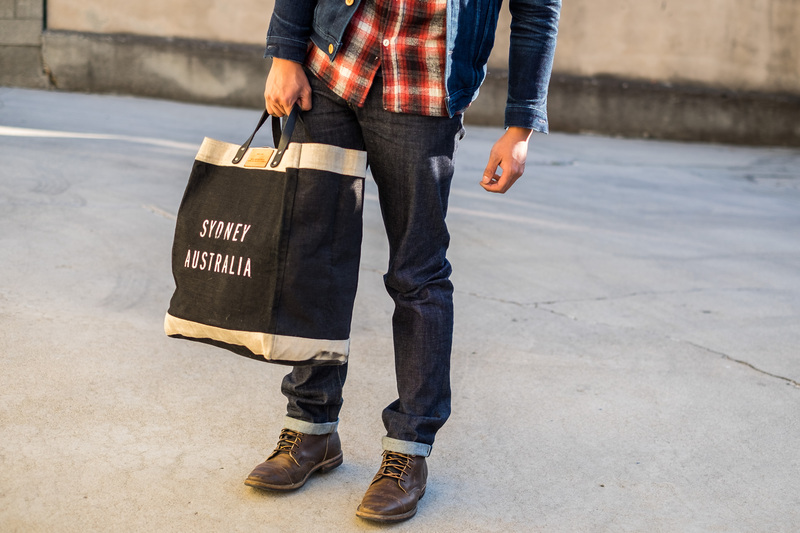 Especially if the bag is carried by your side rubbing against a pair of raw denim. I think Tan is a solid color that won’t go wrong. In the long run, Tan gets darker in most areas of abrasion. In contrast, the aging of Otter is an unusual phenomenon. Otter Green tends to hide stains very well such as dirt, spilled coffee, or indigo dye. I’ve noticed that the color lightens up over the years to a grayish color. 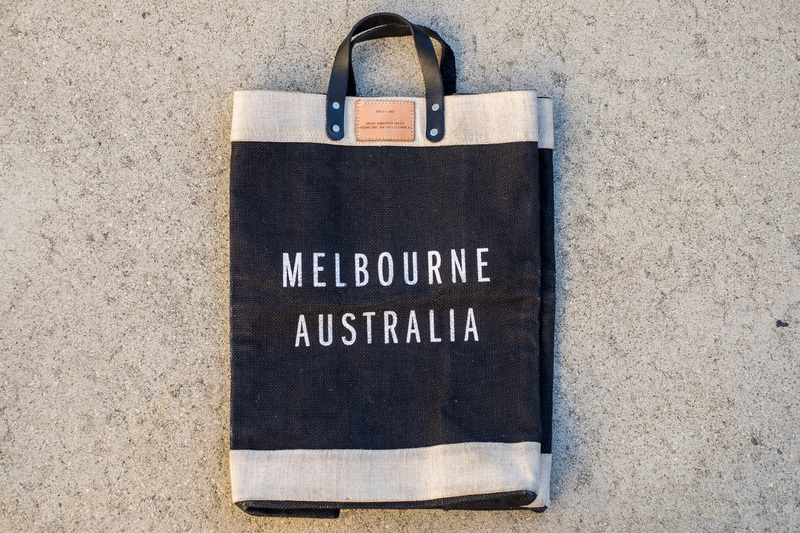 The fading doesn’t happen uniformly on the bag – areas exposed to the sun tend to fade faster. Personally, I love how Otter Green fades over the years. These are some of my Filson Otter Green bags over the years compared to a Filson Tan Zippered Tote Bag. The colors are as true as I can make them as! 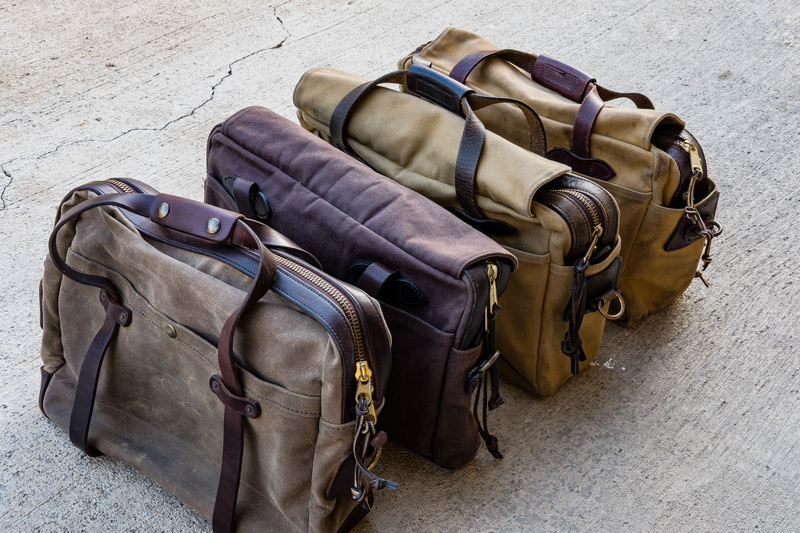 If you’re reading this review, chances are you already know about Filsonand/or perhaps heard of the small brand Vermilyea Pelle (pronounced ver-mil-yuh pel-lee) that also makes great bags, belts, and wallets. 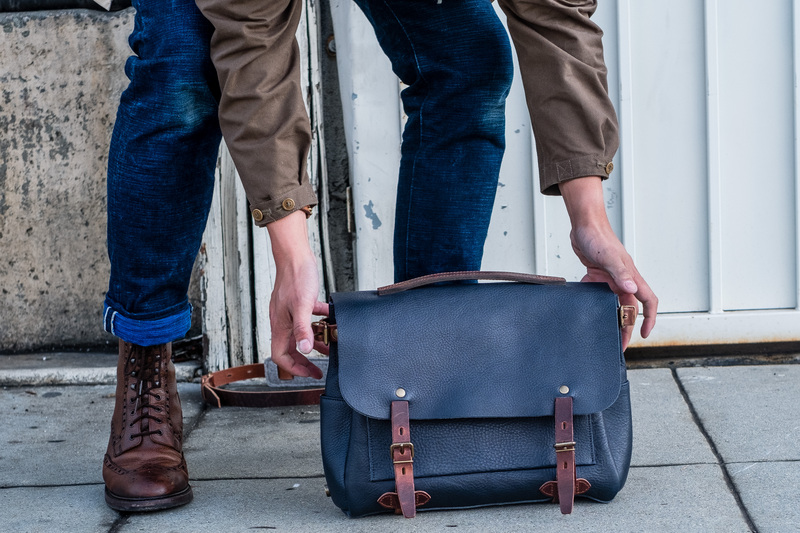 Perhaps you already own a couple of Filson bags or maybe you’re ready to purchase your first quality briefcase for work/school! Rest assured, I hope this post will be of help to you. My first briefcase was purchased in mid 2015 towards the end of my first year of graduate school. It was a Filson 256 Original Briefcase in Brown purchased on sale from Gracious Home (it was so random that this site stocked Filson briefcases!). The price with shipping came out to $148.80 USD. It was more an impulsive buy because of the price; the brown color wasn’t my most ideal choice but that’s all they had at the sale price. My opinion of a Filson’s Brown is that it doesn’t have much of a contrast between the brown leather straps and the canvas. It’s pretty low-key and doesn’t screen Filson from far away. 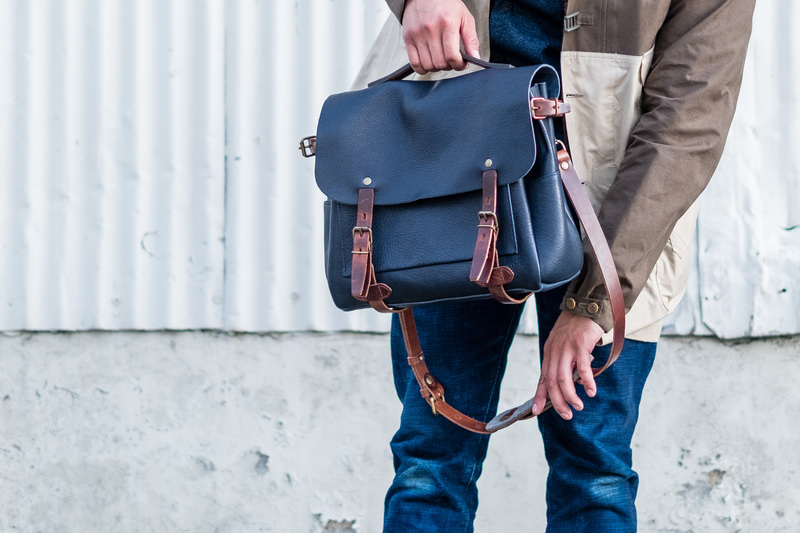 Navy and Brown are great colors for the briefcase if you want something that’s less flashy. 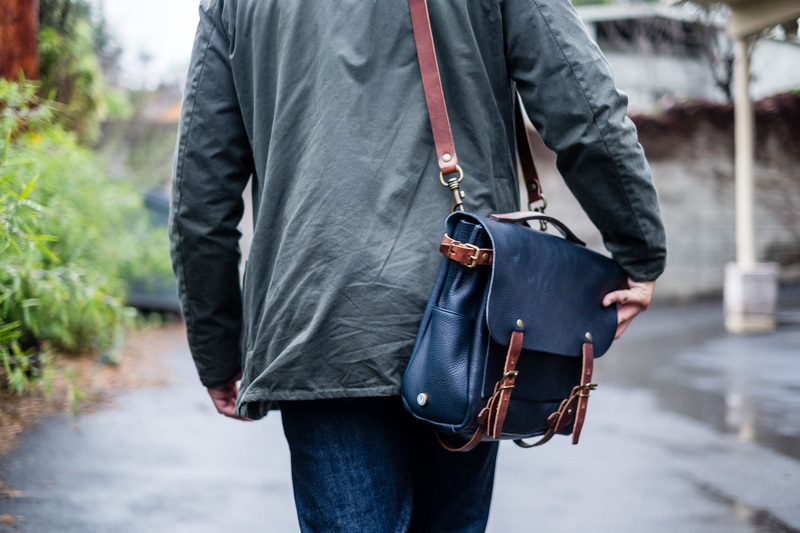 I didn’t need a briefcase as I was already using a Tanner Goods Wilderness Rucksack as my everyday school bag. Backpacks were so much easier on my back, especially when I was carrying a day’s worth of stuff – my gym clothes and sneakers, a laptop and charger, water bottle, camera, and sometimes a tripod. Also, about all of my classmates were also using backpacks (98% of 200 people)! Overhead view of all 4 briefcases. 257 and 258 getting wide and chunky! Less than 6 months later, my now ex-girlfriend purchased a Vermilyea Pelle Briefcase for my birthday. I was raving to her at least a month earlier how I wanted one. 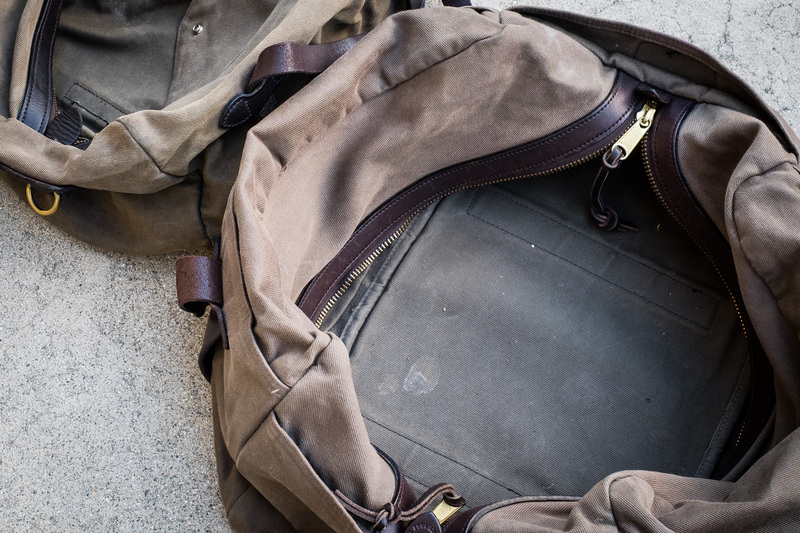 Read up on my other VP Weekender Duffle Bag Review to find more information on the construction of the bag (the quality of the weekender is exactly on par to the briefcase). 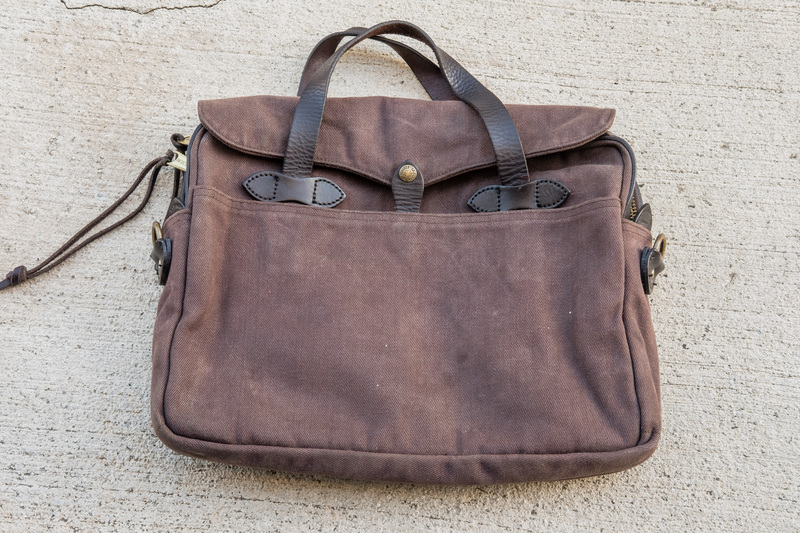 The Filson 258 Padded Computer Briefcase I bought used on eBay because it was from the “YKK zipper era”, had a single leather piece padded shoulder strap, and an absolute steal ($132.40 USD shipped). 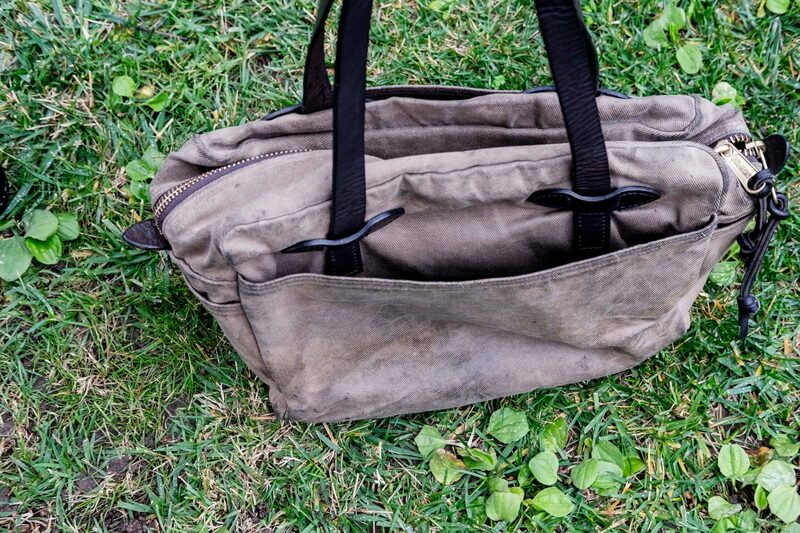 Head over to read my review on the Filson Zippered Tote to learn more about the my opinion on Filson’s change in quality over the years and why I recommend buying a used one. Again, another impulse purchase that I didn’t need! All of the briefcases have hand grips included except for the 256! 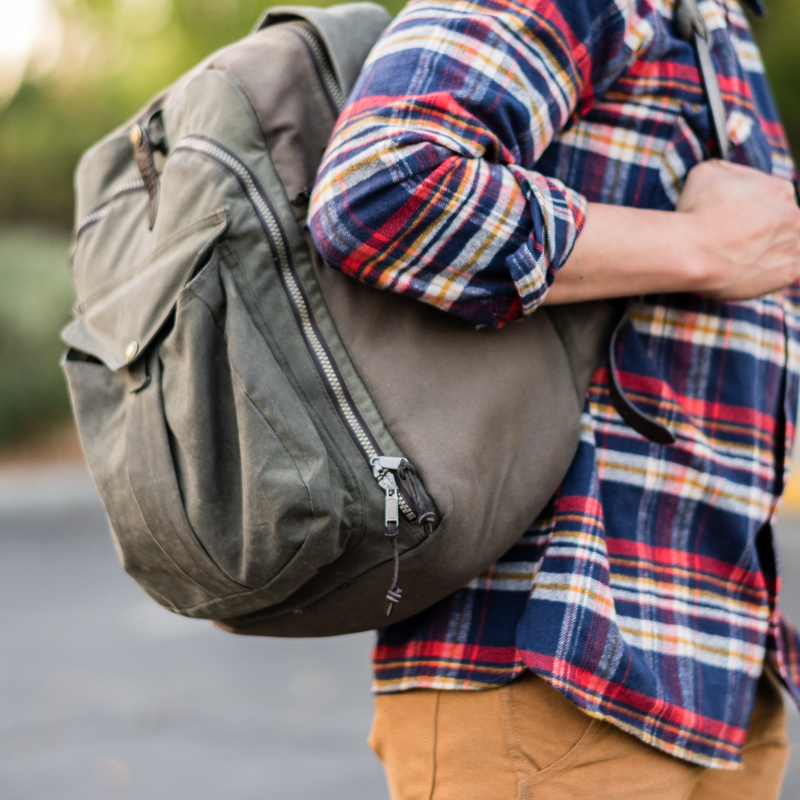 Bookmark an eBay search for “Filson” in the category “Backpacks, Bags & Briefcases” and only show “Pre-owned” condition. I recommend sorting by “Time: newly listed”. Modify the title if you want a specific model like a 257, and you can also add email notifications. 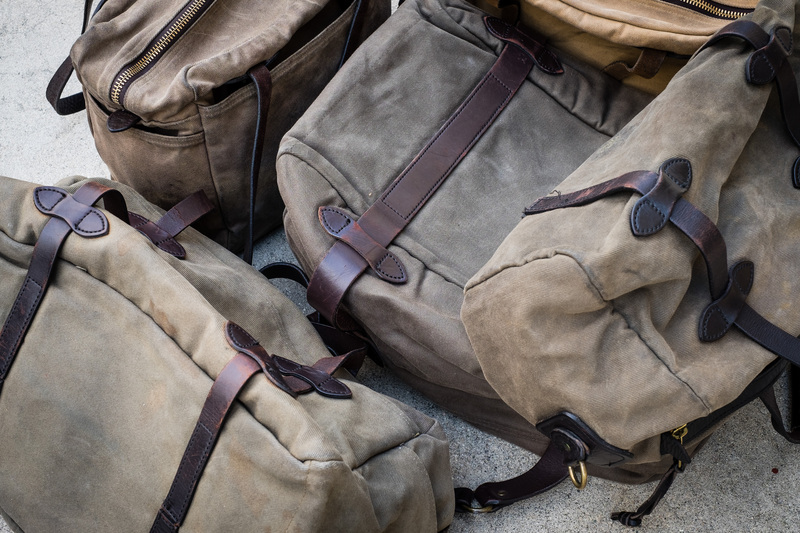 Here’s a search for all used Filson bags and sorted by newly listed. During my final year in graduate school which is all clinical rotations (no more classroom lectures), it finally was appropriate to bring a briefcase over a backpack. 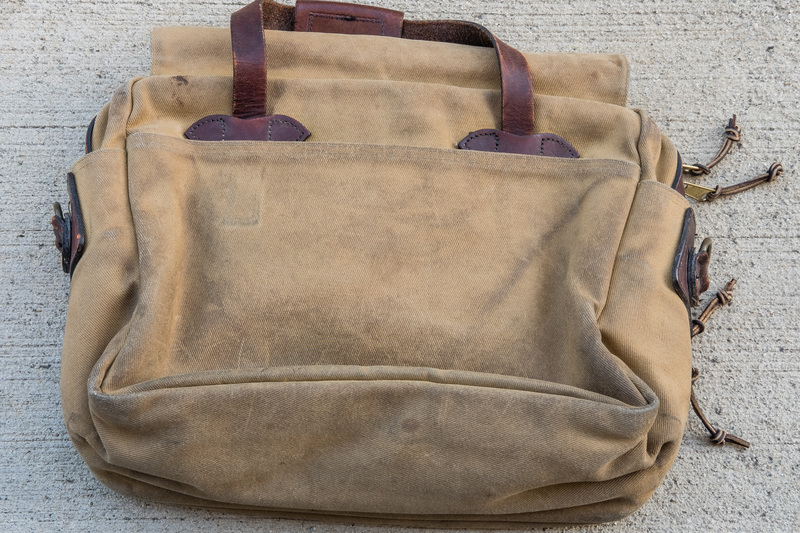 At this point I owned 3 briefcase options – the Filson 256, the Filson 258, and the Vermilyea Pelle briefcase. The 256 could not fit my 15.6″ Acer laptop at all even without a case. The VP briefcase was able to fit the naked laptop but occasionally scratched the laptop it from the YKK zippers. The 258 had too much unnecessary padding which made it quite bulky in width and heavy. Looking for something larger than the 256 and VP, but also less bulkier/heavier than the 258, I was certain the Filson 257 Computer Briefcase was perfect regarding size and bulk for my needs. After checking eBay for several nights, I eventually found a “YKK era” used one at $188.88 USD shipped. 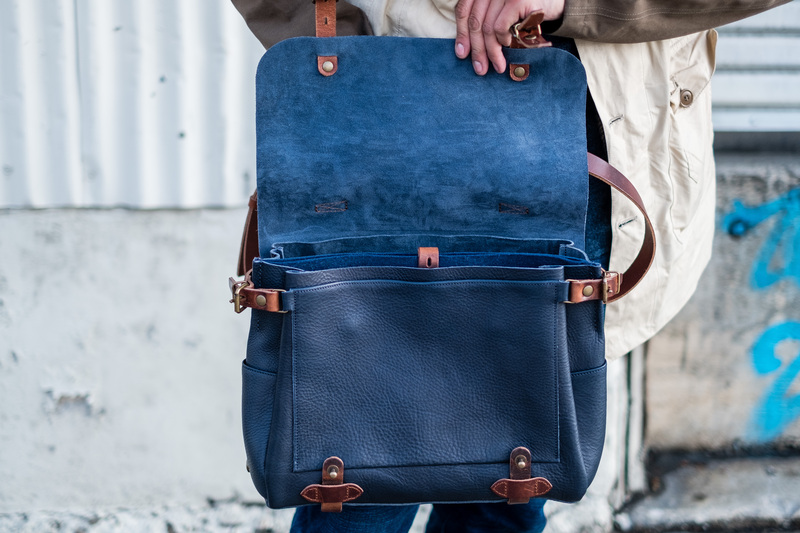 Dustin Spencer of Vermilyea Pelle produces several makeups of the briefcase in varying leathers and briefcase material. At time of the purchase, I wanted the “standard” Ranger Tan / Brown CXL version which was the most popularly makeup posted on social media. The Ranger Tan waxed canvas is a dark tan color, is quite heavily waxed, and the texture of the canvas feels pebbly/bumpy (because of the canvas weave compared to unidirectional twill on Filson bags). The wax provides additional water and abrasion resistance for the canvas. Filson’s signature rugged twill is treated with some sort of water repellant which eventually wears off over time. 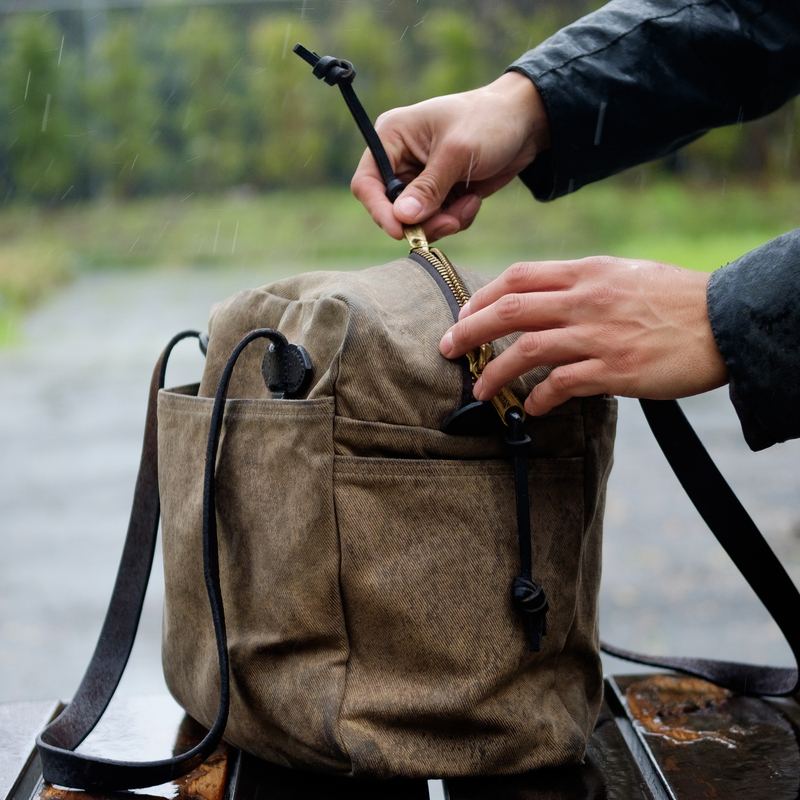 If you want to keep your Filson bag pristine from rain and dirt, hit it up with a coating of Scotchgard spray every so often. Scotchgard is a synthetic water repellant spray used for furniture/fabric/carpet, and it does not change the original color. The CXL on this bag was the thickest CXL I’ve ever handled. The CXL on my Alden footwear, Viberg footwear, and Tanner Goods wallets did not even come close! I pulled out some digital calipers to test out the thickness of the CXL leather. Before measuring, I guessed that the exterior leather bottom and double stitched leather parallel to the zippers were thinner than the rest of the bag, and I was somewhat right. The shoulder strap, shoulder pad, briefcase handles, parallel stitched leather were very similar in thickness 4.0mm +/- 0.2mm. For reference, 2 US quarter coins together are 3.5mm. Even the handle tabs holding the handles to the briefcase were just as thick. The leather bottom was thinner at 2.3mm +/- 0.2mm. My bag’s bottom has superficial scuffs at the corners and a few nicks not too deep. I haven’t felt the need to condition the CXL bottom yet or other leather pieces. But when I do, I plan on using Lexol Leather Conditioner (I prefer it over Venetian Shoe Cream). 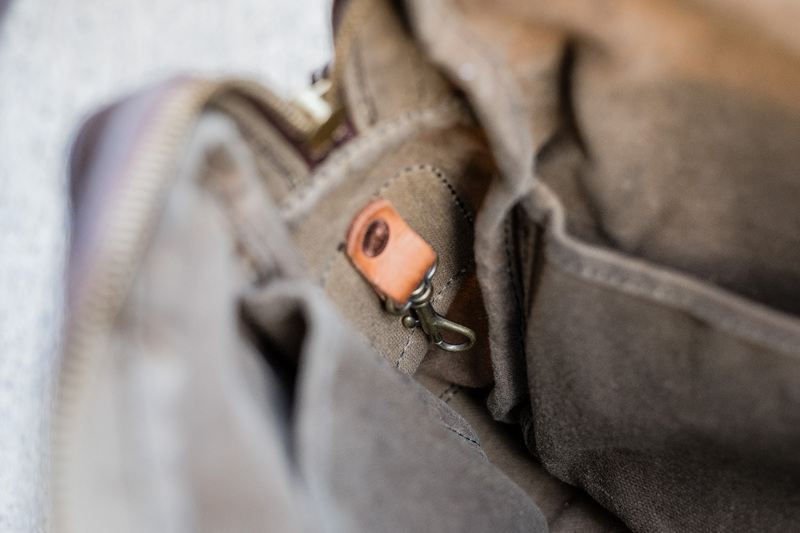 The copper rivets are at the bottom of the bag to attach the handle straps to the bag, at the handle holders, and also at the shoulder strap attachments. Because the CXL leather is very thick and packed with oils, the D ring leather attachments at the briefcase’s ends bend easily without any leather cracking. 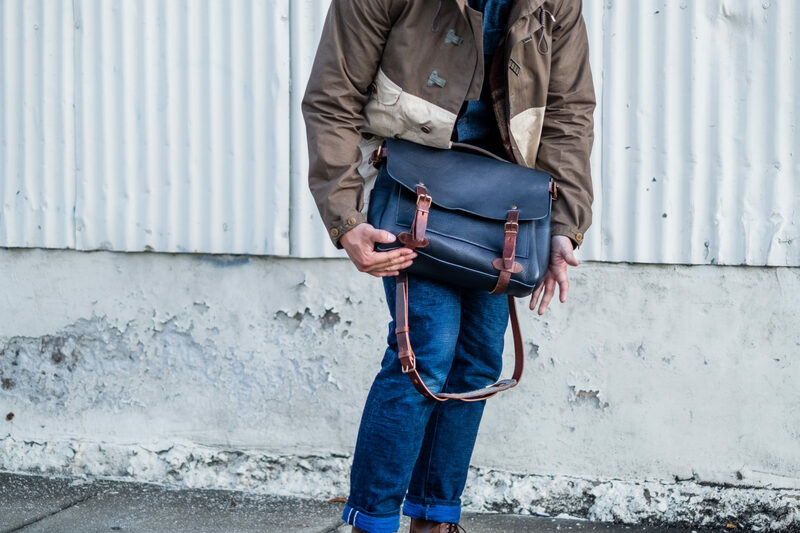 Filson briefcases have the tendency of their bridle leather to crack at this area. 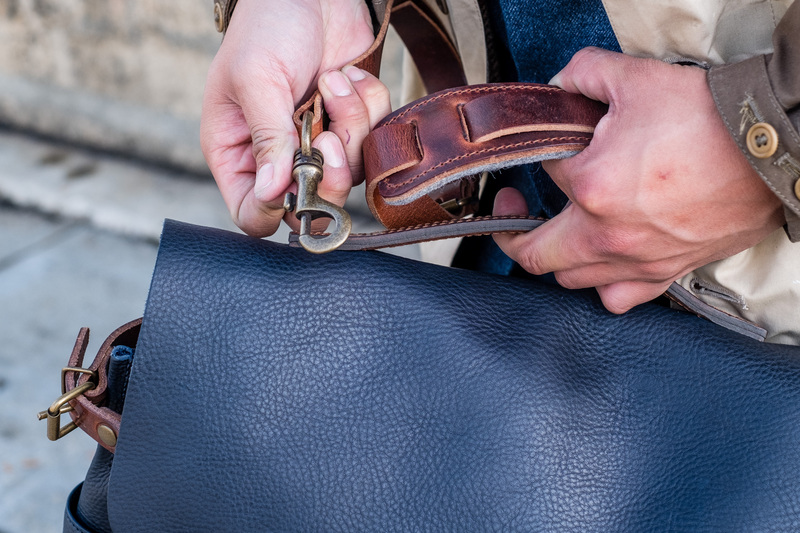 The snaps are most useful to keep the pockets close to the briefcase for a compact look. It also adds another layer of security in those pockets in case your bag ever completely flips over (lol). Filson document pockets sometimes tend to flare out both when empty and filled. Another small detail that provides durability is that a circular leather piece was placed in between MALE parts of the stud to prevent the canvas from ripping through when using the snaps. The stud is the part that receives the most stress when unbuttoning with the Snap cap. The main zippers are Heavy duty YKK and have a great brass shine. I really like the rawhide leather pulls that Vermilyea Pelle includes on their zippers. They come with edges burnished, are well waxed, and likely come from the same quality supplier as the laces I use on my Viberg boots. All my VP bags came with a thick VP logo leather tag (removable) attached to a bag handle with rawhide laces. I’ve never been more impressed with a company’s tag! From the 3 tags I joyfully have now, the average width of a tag is 3.7mm (+/-0.4mm), basically the width of two US quarter coins! The leather of the tag looks like some kind of vegetable tanned leather. VP’s shoulder pad length is about 12 inches while Filson’s shoulder pad length is about 8.5 inches. The shoulder pad doesn’t need any breaking in from day one. 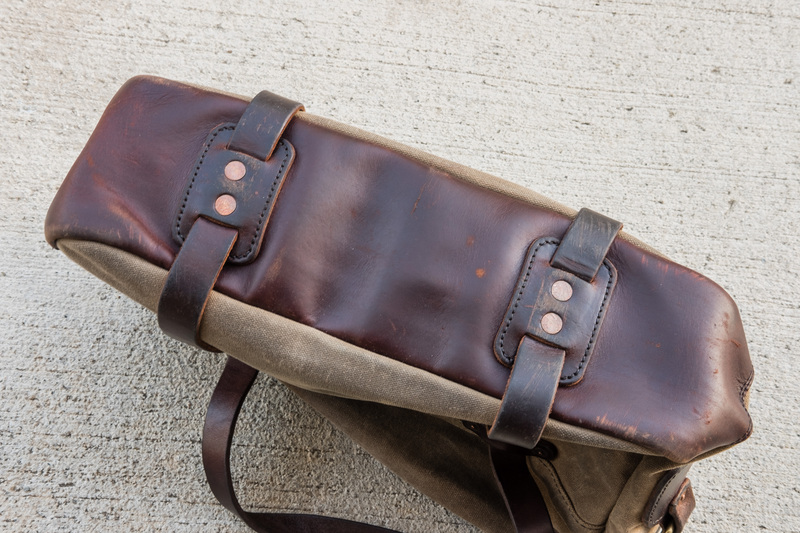 It starts off soft (likely because it’s Chromexcel leather) and the underside surface has more grip than Filson’s. With Filson’s shoulder pad, I have to take sandpaper to the underside to create some grip or else it slips off my shoulder. 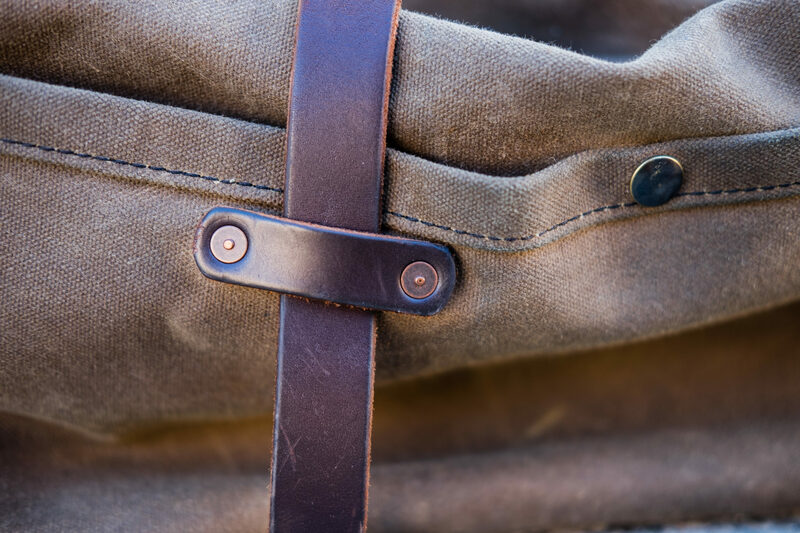 On the Filson Briefcases, the end pockets are available for use. The 256 end pockets are very small and practically unusable. The 257 and 258 briefcases have much larger end pockets, enough to fit in a large water bottle such as my 1L HydroFlask after being stretched. 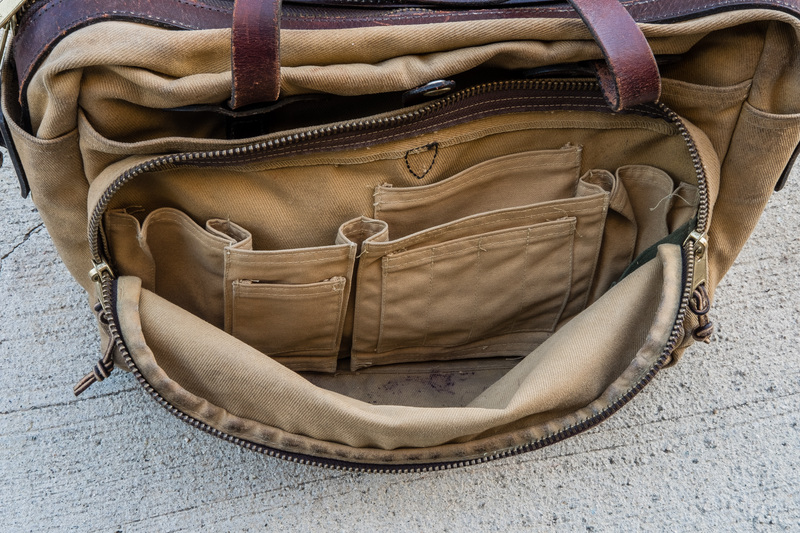 All of Filson’s briefcase end pockets start out stiff but do stretch a bit over time. If you have a new bag, I recommend wedging random objects in those pockets to stretch them out. 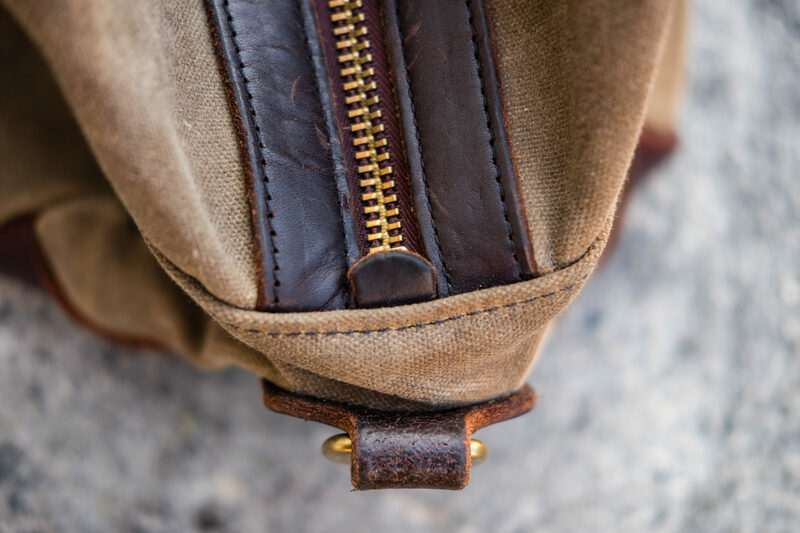 Because the Filson briefcases have end pockets, this also means that the leather which attaches the shoulder straps/D rings are actually connected to the pocket fabric instead of the fabric directly on the bag. 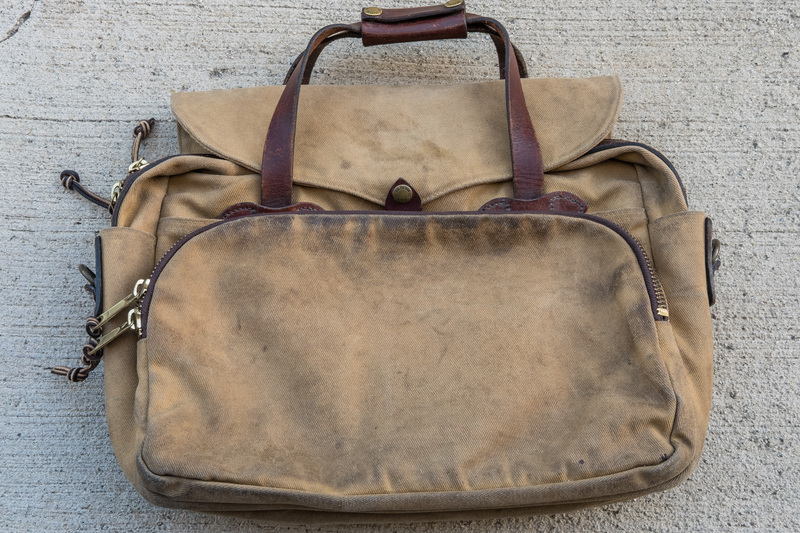 While this difference seems minor, there was one occasion with my Filson x Apolis Philantropist Briefcase where the tailor had an easier time repairing it. 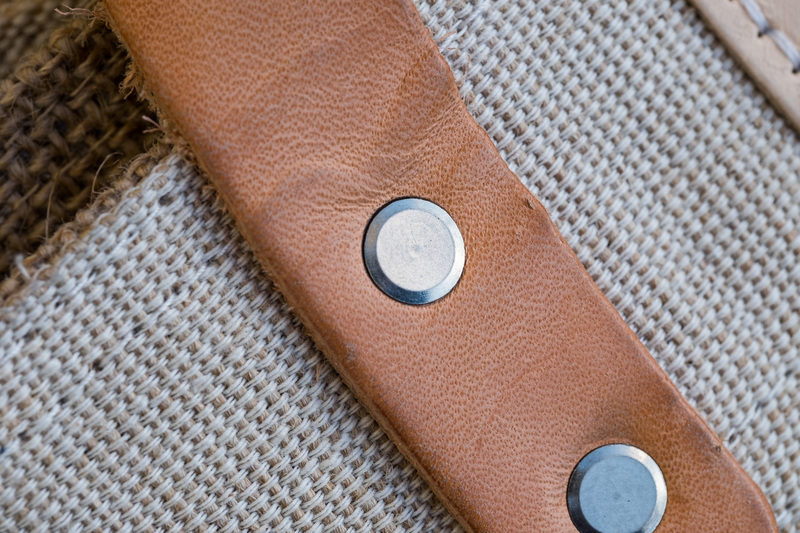 The D ring leather piece was detaching from the frayed canvas. The tailor was able to place piece of leather behind it (in the pocket) and stitch them altogether using the same stitching holes. I actually don’t think this is a con. 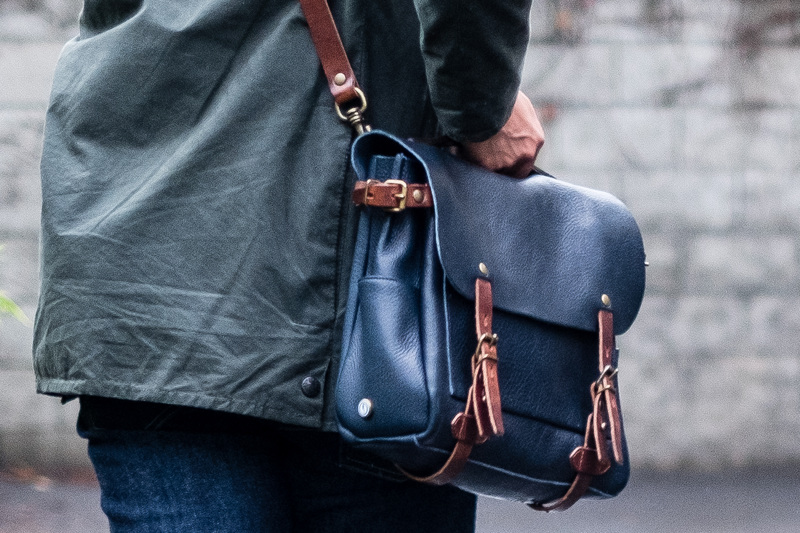 Given the smaller dimensions of the VP briefcase, a “fair” matchup is comparing it to the Filson 256. As I mentioned earlier, the end pockets on the 256 are absolutely unusable anyways. 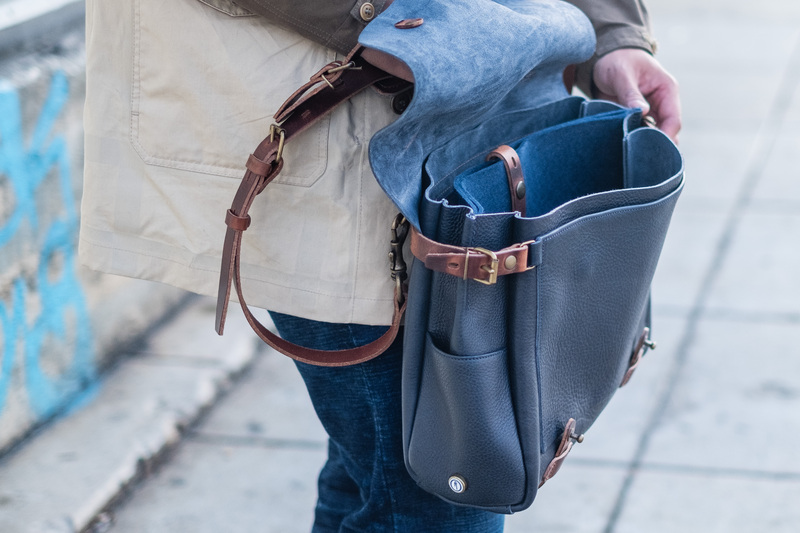 The design of the VP forgoing the end pockets actually increases the bag’s durability. Similar to how the Snap caps were placed in the document pockets, the leather piece that holds the D rings attaching the shoulder strap are held by a rivet. The rivet goes through the thick leather all the way into the interior where it again is complemented by a leather piece to prevent the waxed canvas from ripping/tearing through. 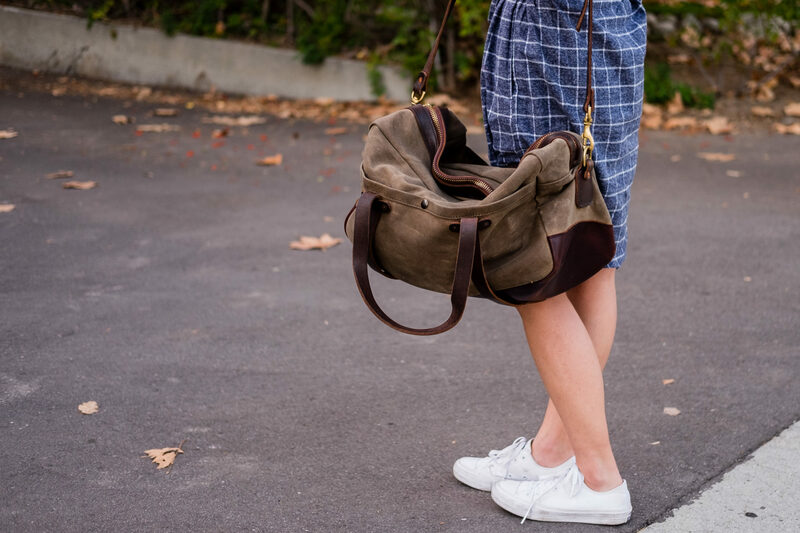 When the shoulder strap is used, this leather piece helps distributes the stress (the bag’s weight) over a larger area. 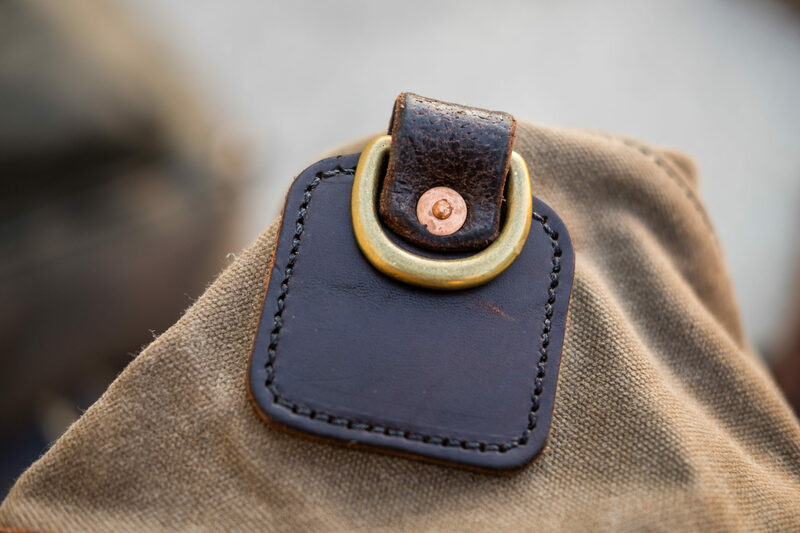 Tiny edge pocket available on Filson 256. I think I can fit two fingers width in the pocket! Filson 257 end pocket getting larger. Notice how the D ring attachment differs from the 256. 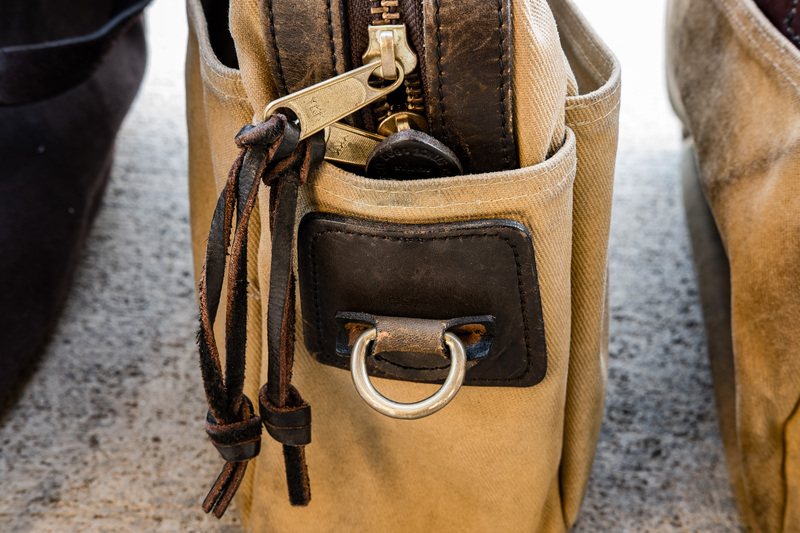 Filson 258 end pocket. Supposedly the largest pocket! 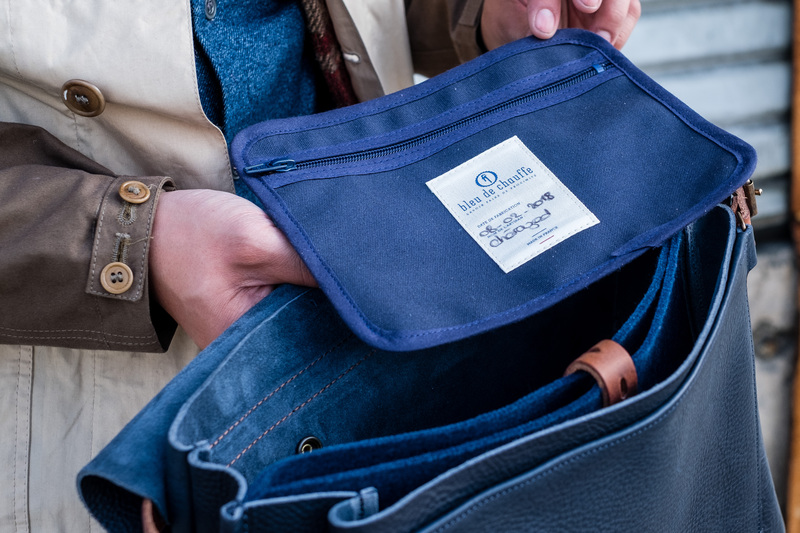 The VP briefcase handles attach to the document pockets which makes the pocket access obstructive because the handles have to be folded away from the bag. On the other hand, this design allows the bag to display the beauty of the leather used on the bag (more leather is required). From what I can see, two very long leather pieces were used for the handles. The simplest way I can describe the design is two upside down “U” leather pieces as the handles, one on each side of the bag. The handles attach at the bottom of the bag by huge huge copper rivets (so 4 copper rivets total at the bottom). 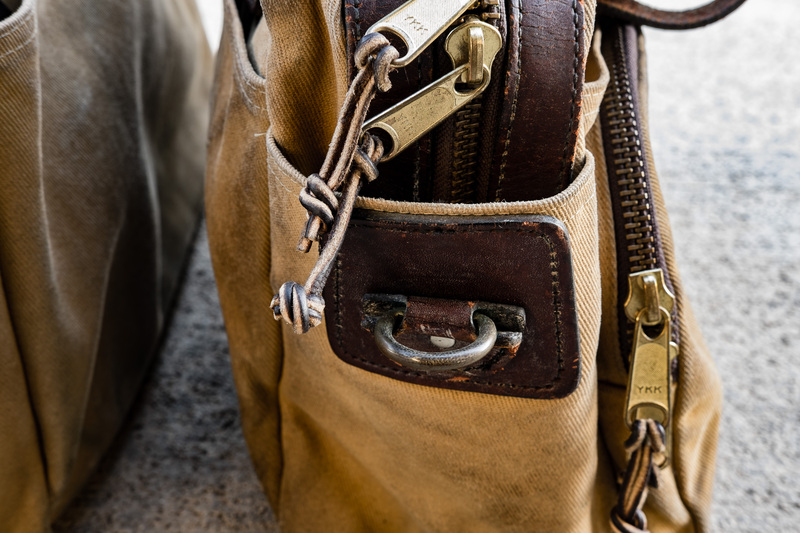 Filson briefcase handles attach directly to the main bag. VP briefcase handles attach on the exterior pocket. The length of the key clip is about 0.5 inches and located on the interior side of the bag (later models changed this). Tiny key clip on the inside! The total length of the strap at its last hole is about 51 inches. I use the last hole even though I tend to like my shoulder straps short to keep the bag closer to my body. I’m sure if you request/contact Dustin regarding a longer strap, he’ll be able to accommodate that for you! 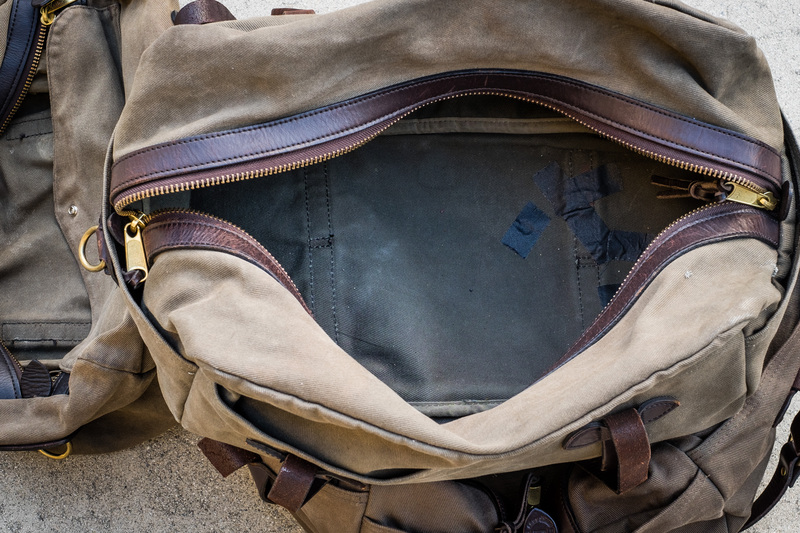 From what I see on the most recent briefcase models, Dustin has moved the key clip to attach at a seam above one of the three interior pockets and also lengthened it (great change!). Also, a small leather logo patch placed on one of the interior dividers. I’ll first talk about the Filson “guaranteed for life” warranty. 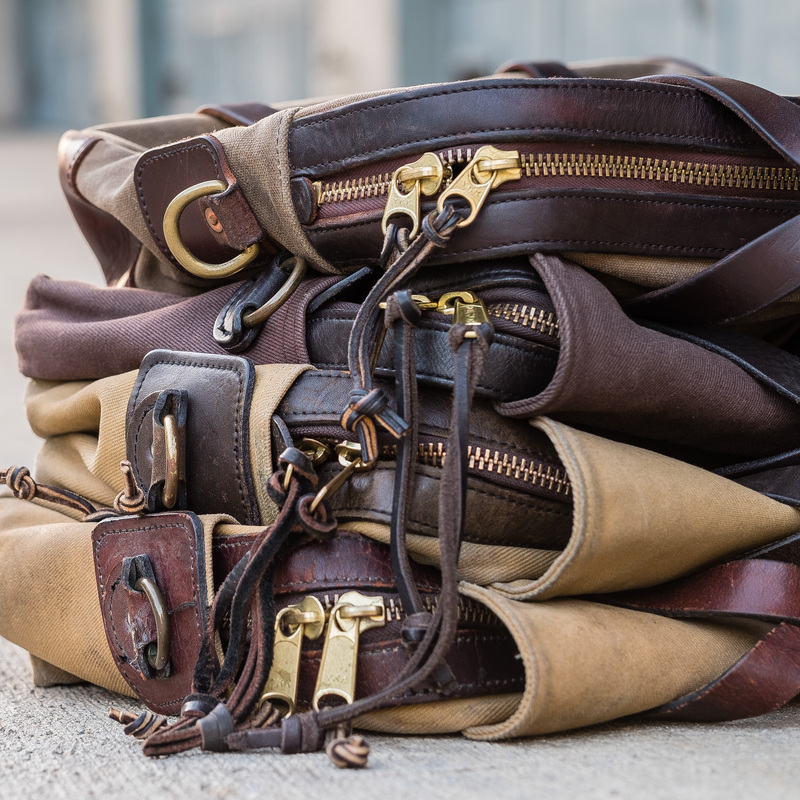 With Filson products including bags, garments, etc, they will either repair or replace the item free of charge. In some rare cases, such as those occurring not due to normal wear/tear, there may be a small charge. Such examples I can think of is if you spilled battery acid on your briefcase, your child decided to take a pair of scissors to your bag, or if your used your shoulder strap as a chew toy. 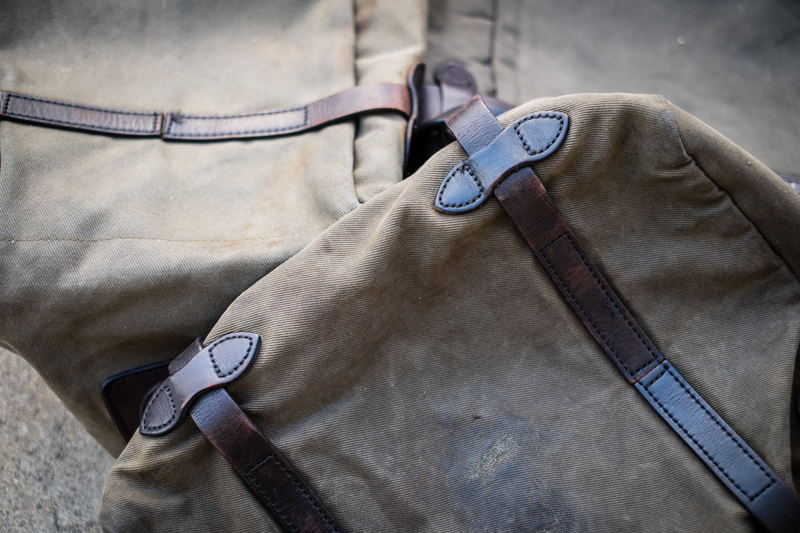 The most common reasons why Filson bags are repaired is because the twill canvas is fraying or the leather piece attaching the D rings are cracking or have completely torn through. I’ve heard stories of hunters absolutely wearing the hell of of their Tin Chaps, getting them ripped and torn against brush or rough terrain, and then sending them back at the end of every season to get them repaired. That’s pretty cool! To me, that’s considered “normal” wear/tear. 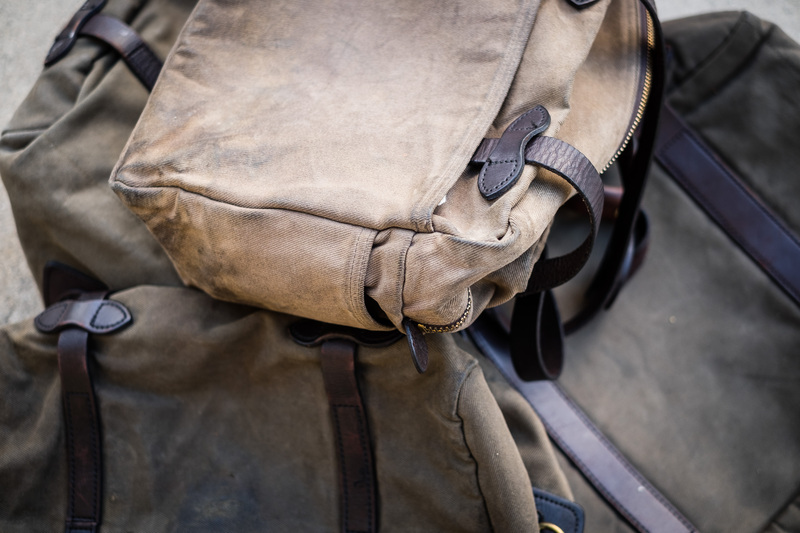 You send in your item to be evaluated by Filson’s return team for a possible repair (no guarantees that they can until they receive and evaluate it). The return team would determine whether they would be able to repair the bag. Most repairs are covered under the warranty, and would not incur any costs. Repairs take about 4-6 weeks to be completed, and they would only contact you if more information is needed. If you decide you want to send it in to be evaluated, include your contact information on the package. You should include your full name, a returns address, daytime telephone number, and/or email address. And please explain the reason for the return and the outcome you desire. Now regarding that warranty from a company that has been around for more than a century, let’s talk about Vermilyea Pelle’s. I’ve searched on VP’s website, social media, and the rest of the web for anything mentioning a warranty but couldn’t find anything. The only thing that is most similar is the Repairs section in the FAQ of the website – let’s just call that the “warranty”. I’ll contact Dustin later to see what he says directly, but I think I have an idea of their company stands behind. So the question that’s more important to ask is what’s covered and what’s not. To my understanding, normal wear and tear is NOT covered by the warranty such as the waxed canvas eventually fraying/wearing through because of abrasion, the stitching coming undone, or bottom leather getting deep cuts. (I’m not even sure how you’d even repair this other than replacing the whole bottom anyways). 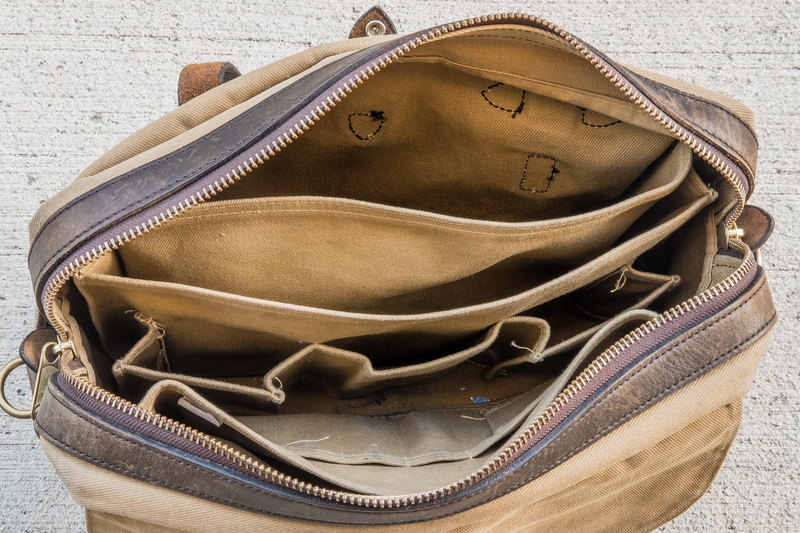 These issues are easily repaired by taking it to your local tailor or leather repair shop. 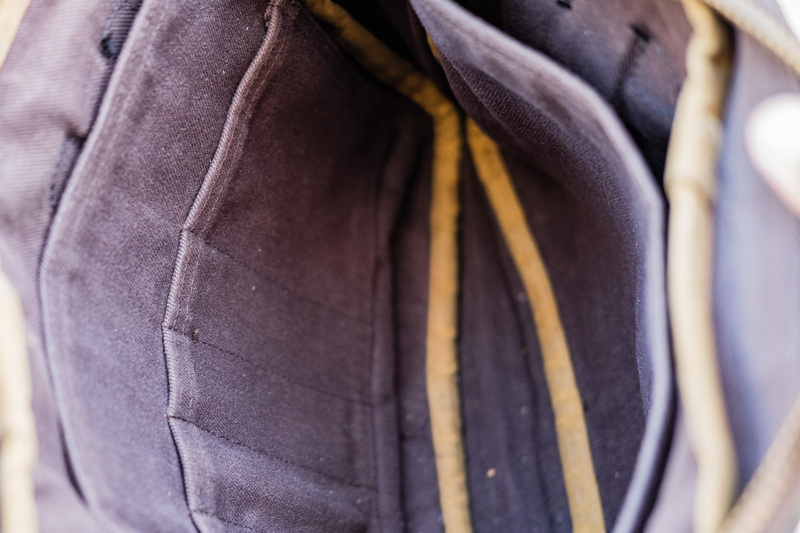 A tailor can stitch up the fraying prevent it from becoming worse, and a leatherworker can apply a bit of glue in the cut in the leather gash so it’s hardly visible. What I believe IS covered by the warranty is any hardware failure or overlooked/missed stitching. Such as a snap cap popping off randomly and from either the document pocket or the hand grip or rivets coming undone. Holding the bag in front of me, I think those are the areas that the bag will actually “fail” first. 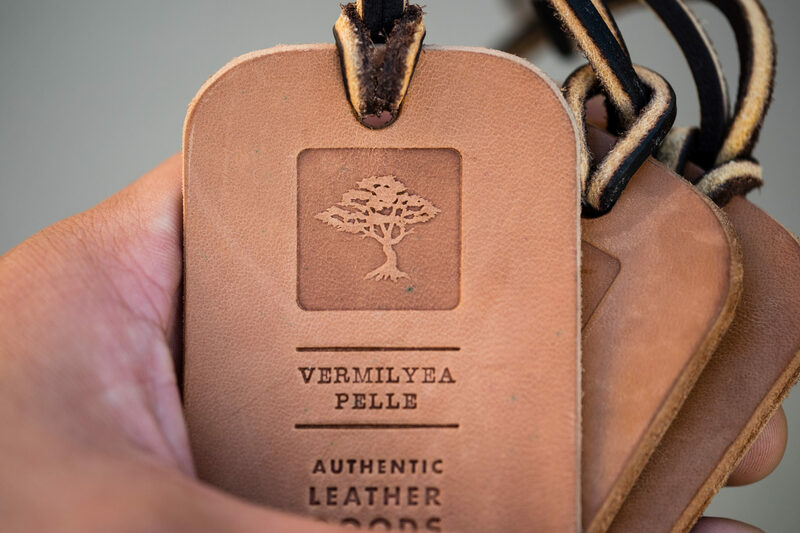 Vermilyea Pelle has been around producing briefcases for only a few years. A couple years may not provide enough wear to a bag to come to a conclusion about even having a warranty. In fact, Dustin posts his pics of prototype bags on Instagram quite often! 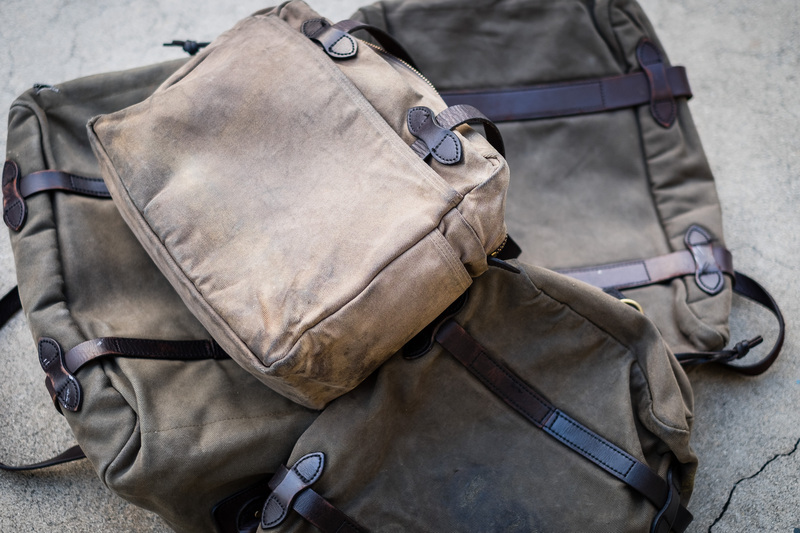 Comparing VP to Filson who has been producing luggage since the 1980s wouldn’t be fair. Also Filson started off producing garments before luggage! I’ve been very fond of Dustin’s work since I heard of his company in 2014 on Styleforum and Instagram. Back in 2015, my girlfriend at the time ordered a briefcase from Vermilyea Pelle for my birthday. I let her know beforehand that I wanted the typical Brown CXL and Ranger Tan Waxed Canvas makeup. She exchanged emails with him a few times, and on my birthday I became a new owner of a VP Briefcase! Now, onto the product we’ll talk about. I will state that there are only so many designs of bags that are practical. 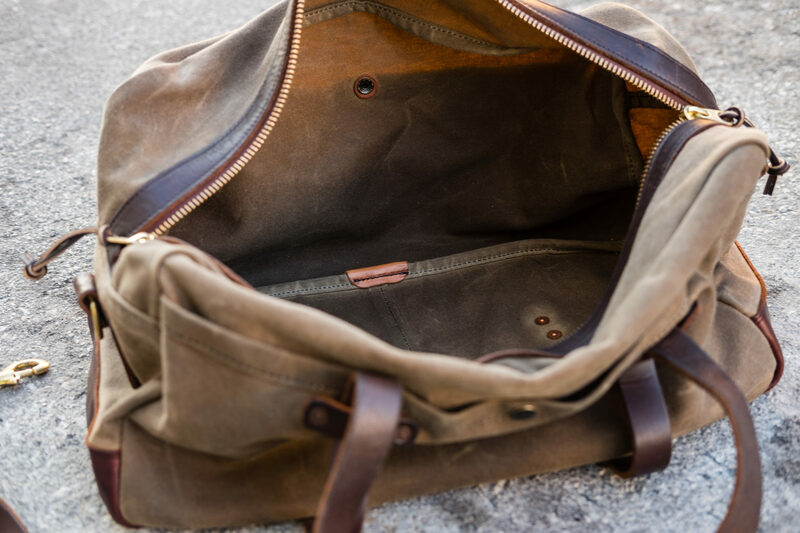 The VP 20″ Weekender Duffle seems to encompass many elements of the retired Filson Traveler’s Bag. 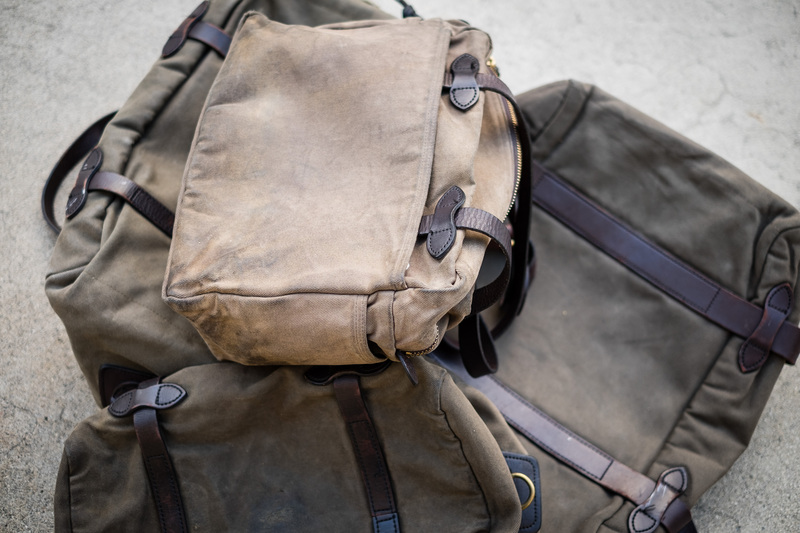 I, myself, currently own both the Medium and Large sized Filson Travel Bags, so my review on the VP Duffle bag will be based primarily upon my comparison with those. I purchased the VP Weekender Duffle bag in person at Railcar Fine Goods on 11/26/2017 at a price of $282.31 after tax. Because I knew of the canvas and leather beforehand from my VP briefcase, I knew the quality of the bag was to match. It fact, back in 2015, Railcar was the only local stockist that carried VP! The reason I purchased the bag was that it was discounted – I can’t remember off the top of my head what the % discount was on the tag, but to my knowledge, it was the first time I’ve seen a VP included in a sale. (+) This is a simple, well-designed bag with quality materials. The copper rivets and stitching on the bag are very well done. I can’t imagine the bag failing at all anytime soon. 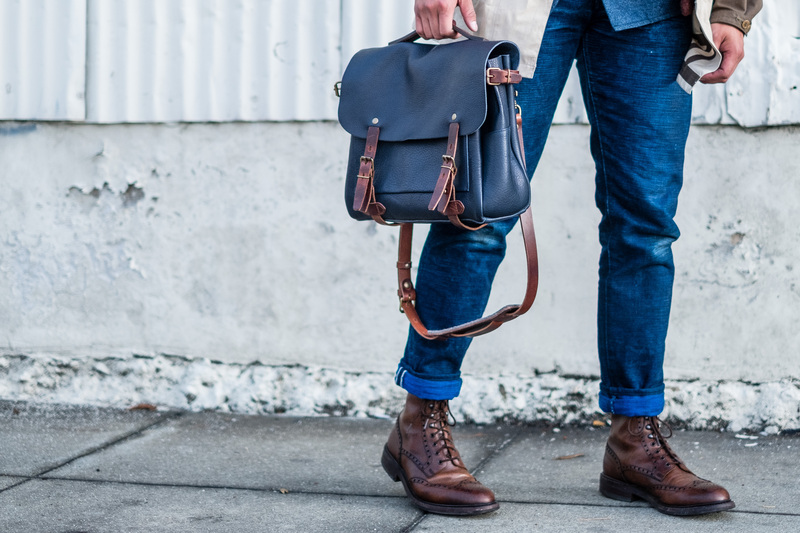 VP utilizes the best Horween Chromexcel Leather, and Ican see that supported by the leather on the bag being very thick and displaying no signs of loose grain creasing (seen prominently in boots). 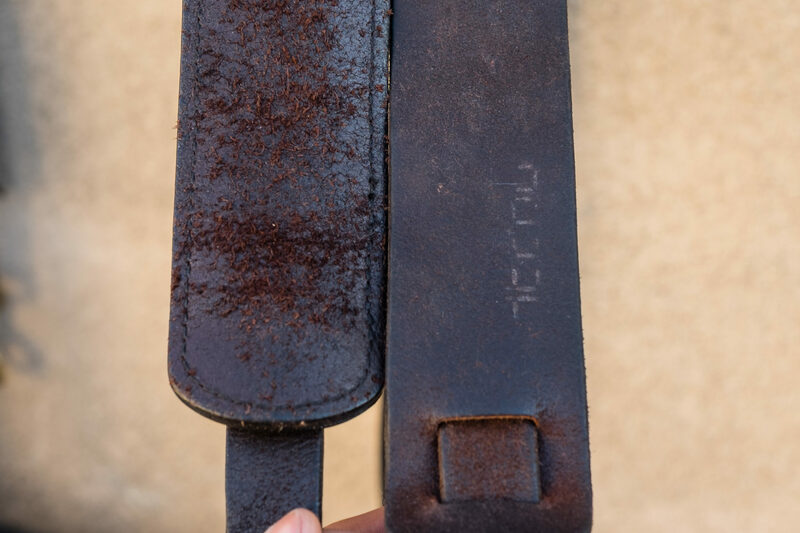 Compared to Filson’s Bridle Leather, the CXL leather on the straps is nearly twice as thick (5.3mm vs 2.7mm). The main compartment is accessed by two YKK zippers with burnished, waxed leather pulls. The quality of these rawhide leather pulls feel a lot more substantial than Filson’s and I think they are very similar to the laces I use on some of my Vibergs. 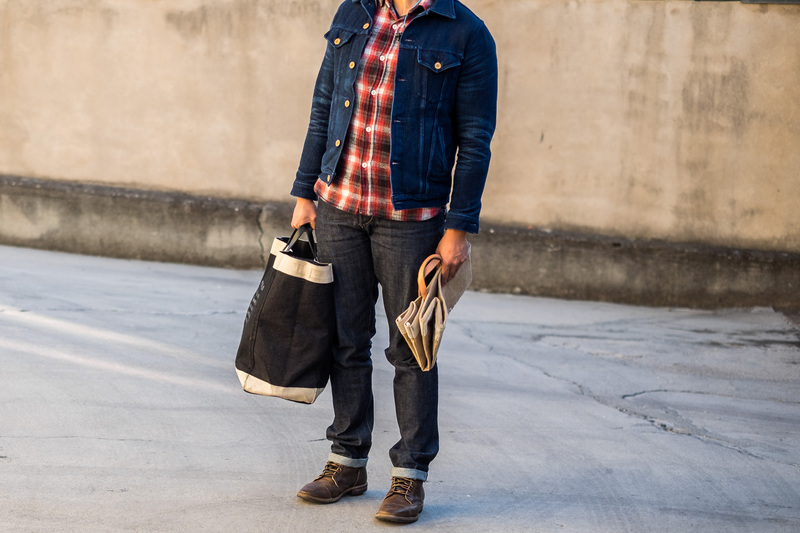 The thickness of the waxed Ranger Tan canvas is essentially the same as Filson’s 22oz Rugged Twill, 3.35mm to 3.30mm. However, the canvas is very well waxed for additional abrasion resistance. Filson’s twill comes with an applied treatment (not “waxed”) and still holds up to rain well fresh out of the factory. 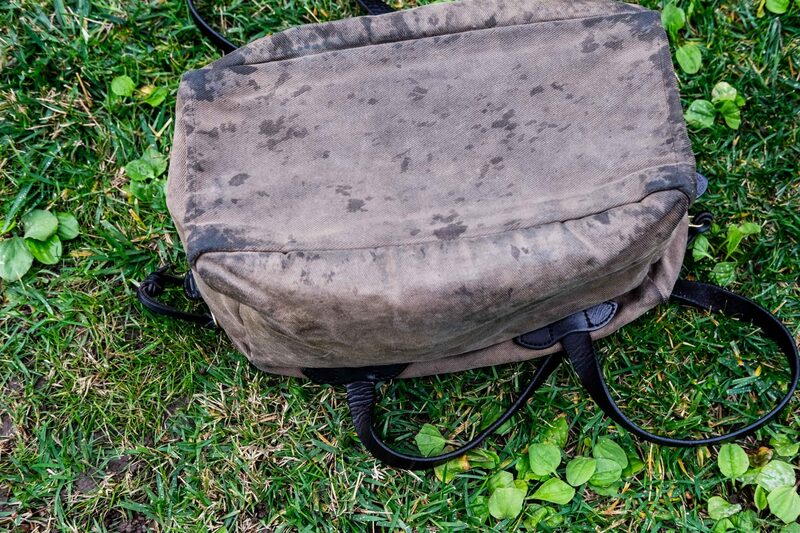 In my experience of rainy days with both bags, the waxed canvas sheds water much better. The interior is a large one compartment with a keychain clip on one side. 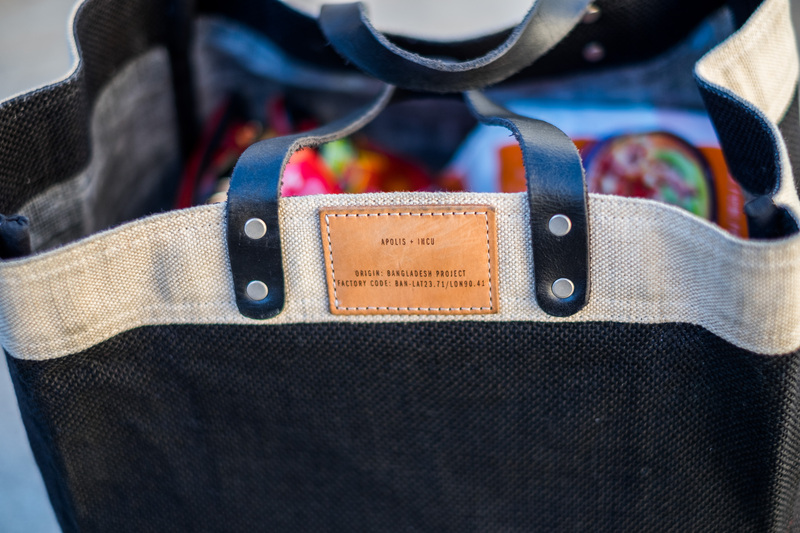 The simplicity of this bag’s design allows you to throw whatever you want into it, or to use your own pouches to seperate goods. 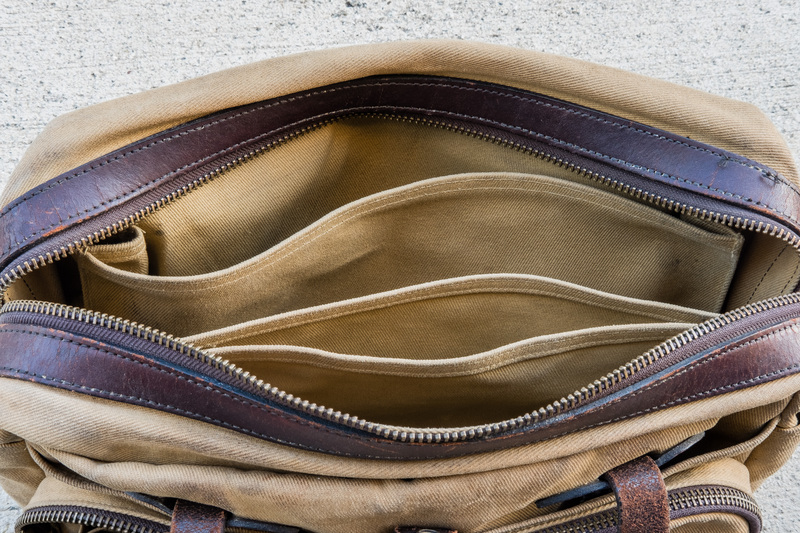 I like duffle bags for this reason as I tend to just throw everything in the same compartment and just shuffle through it when I need something! What’s cool about VP’s bags is that they use copper rivets at all places of stress. I learned a couple years ago that rivets are able to handle stress from any direction where as bar tack stitching handles stresses from the directions perpendicular to them. 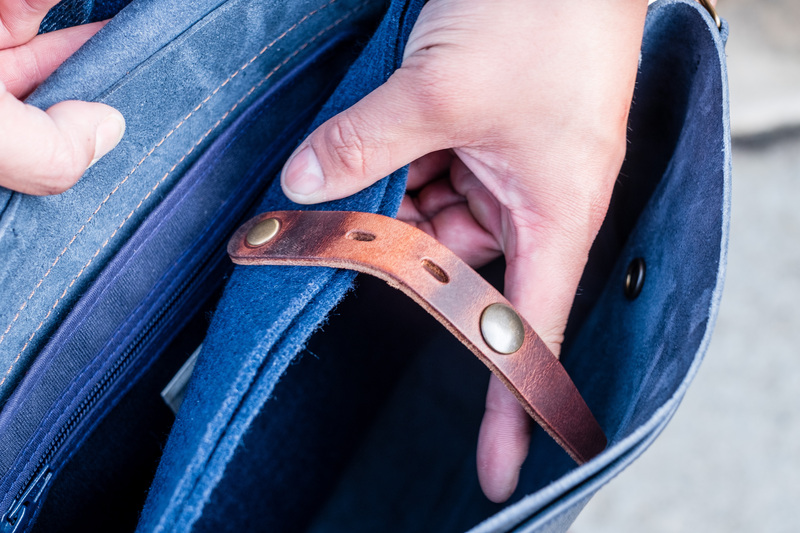 Take a look at your pair of raw denim – Belt loops are typically attached to the pant with bar tack stitches while your front pockets and coin pocket will have rivets. Another feature that VP added was a leather bottom exterior. The primary reason for this is to prevent the bottom of the bag getting wet when setting it down on a rainy day. Also the leather bottom will be more durable than cotton/canvas. I don’t baby where I place my bags, and as you can see, I can’t even find any scratches or nicks on the CXL leather bottom yet! 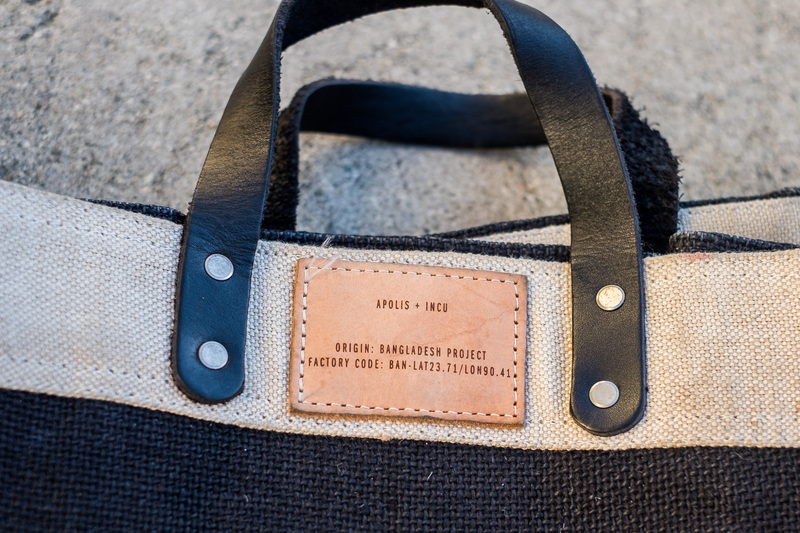 The inner seams are bounded by what feels like another lighter weight waxed canvas for added durability. (-) The interior keychain clip is really tiny compared to the rest of the bag. I might have preferred it to be on the interior of one of the outside pockets like Filson has for their Tote bags. The pull tabs at each end of the zipper are too short to be usable. When you open a zippered bag, one hand pulls the zipper while the other holds the tab to allow you to unzip. I get around this by just grabbing a lateral part of the bag with my other hand while zipping and unzipping. No biggie! The shoulder strap is actually quite short compared to Filson’s. But it’s actually beneficial to carry the bag higher up on your back/side for ergonomic reasons. The minor issue I have with the single piece leather shoulder pad is that the pad’s leather ends tend to fold in. You can basically fix this by not looping the strap through the exterior slits on the pad so that the shoulder pad sits flush on your shoulder. 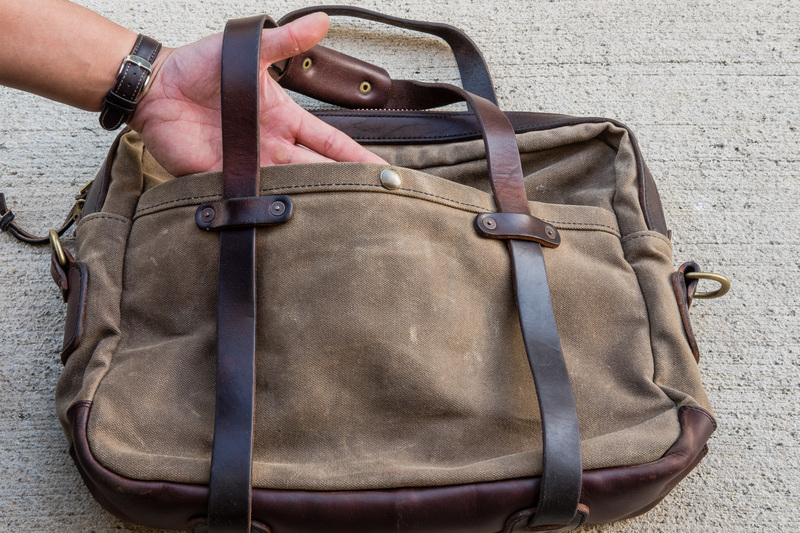 The VP 20″ Weekender Duffle basically is an upgraded version of Filson’s bags. 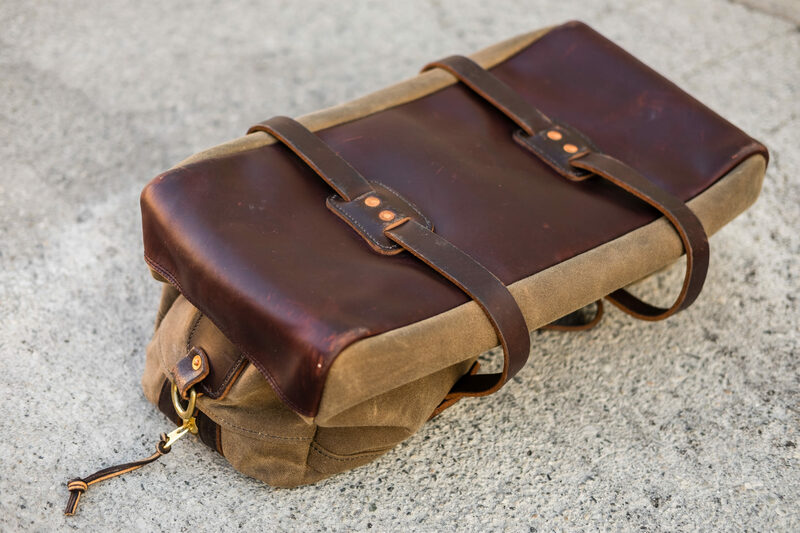 Compared to the MSRP of Filson’s bags, the price of the VP bag is well worth the $385. 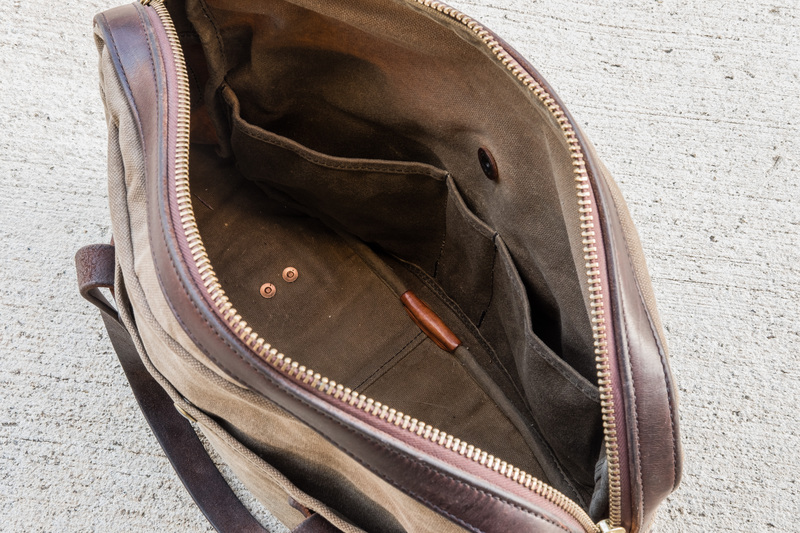 The improvements include a leather bottom, copper rivets, “better” materials (both canvas and leather), added snap buttons on the two exterior pockets to prevent the pockets from flaring out. 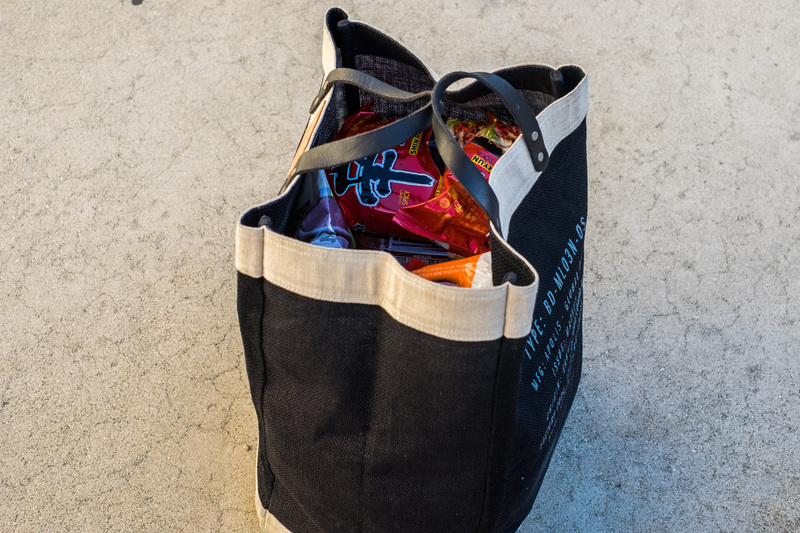 Oh yeah, I only thing that’s missing from this bag is the two “water bottle” pockets at each end. But with the bag loaded, the shoulder straps should essentially prevent any items from fitting at each end. I just toss my water bottle into the main compartment. 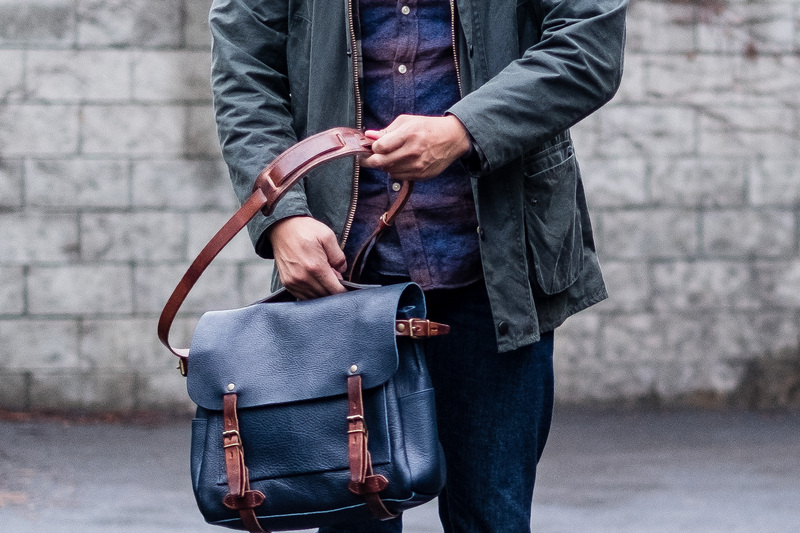 I’ve had my eyes on this Filson Photographer’s Backpack for a couple years now. 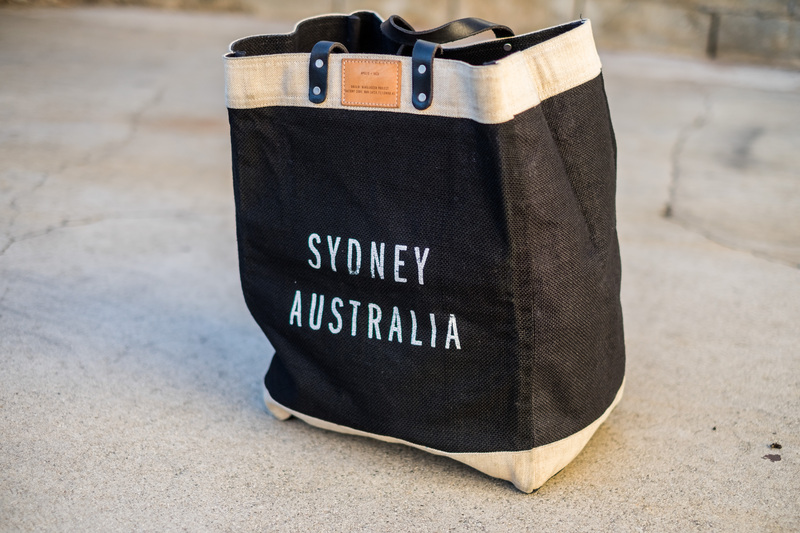 The two and only major reviews of this bag I was able to find online was by Anastasia Petukhova and Nathan Ward. Both of their reviews were accompanied with attractive, droolsome pics. 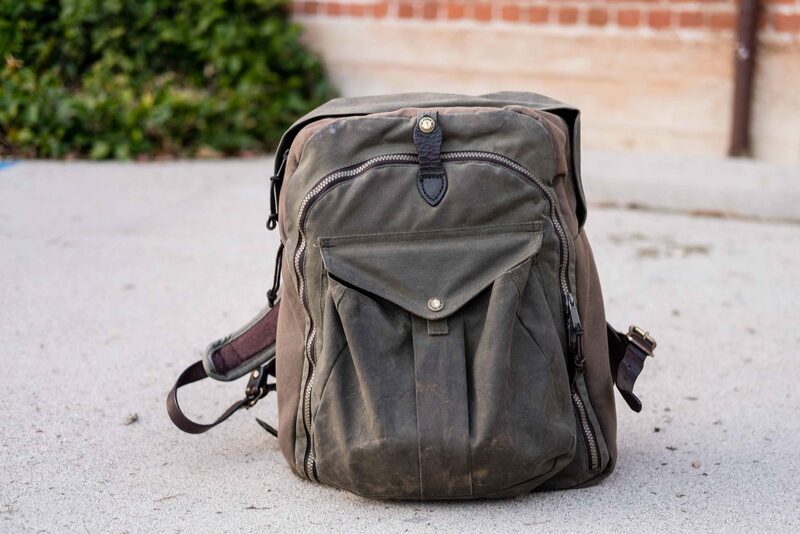 A week ago, I was able to find a used Filson Photographer’s Backpack in Otter Green on Craigslist for a great price! I contacted the dude, received a prompt response, and we met the following day at a Starbucks. 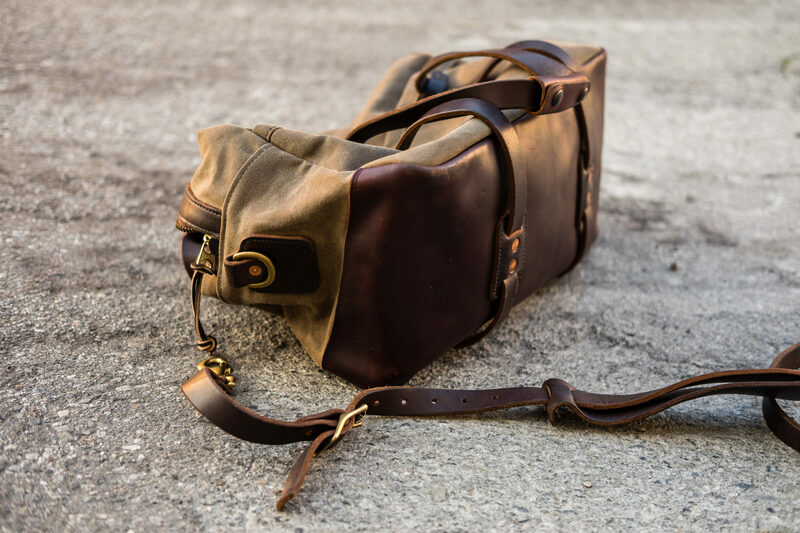 The bag is no longer available directly from Filson, but is currently readily available from Amazon in both Tan and Otter Green. 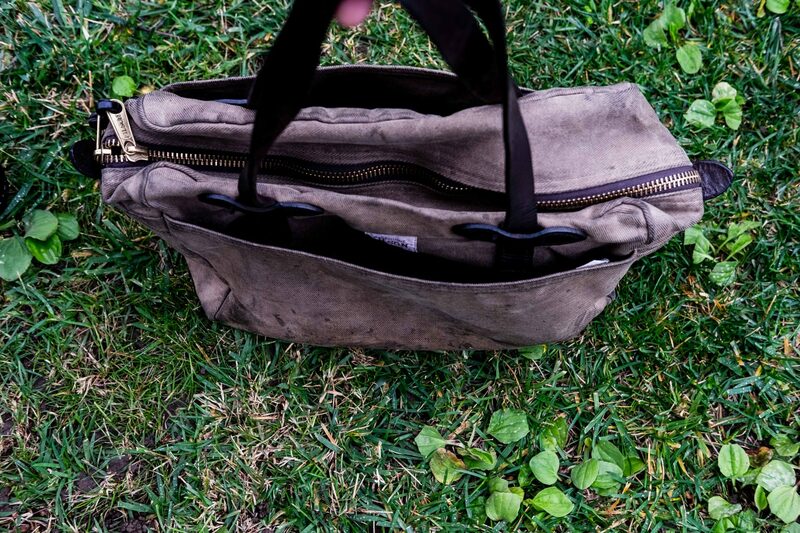 In 2012, the Filson Zippered Tote was the first Filson bag I purchased. I knew about the brand because on Reddit shared that the bags are warrantied for life. Looking through the options online, the zippered tote stood out to me because I wanted an everyday bag and not a briefcase at the time. Between the two Filson colors, I went with the tote in Otter Green instead of Tan because the color is more masculine for a guy carrying a tote. The shape of the bag – like a box also helps with that. I was living in Cupertino, CA at the time and the closest retailer was Doms Outdoor Goods, one of the largest Filson approved stockists in the US, and it was located in Livermore, CA. The other closest stockist was all the way in San Francisco, Unionmade Goods, but they only stocked the tan color according to their website and my experience visiting the store in the past. I called Doms beforehand to ask if they had a Filson 261 in OT in stock. The associate went to go physically check and he responded there was 1 left on the shelf! I decided to take a trip spontaneously that day to buy it. So after a 1 hour drive to Livermore, I ended up purchasing it for about $130. A bit of history about the change of ownership that happened recently. Filson started producing luggage only in the ~1980s to early 90s and before that only clothing. The first zippers they used on their luggage were “Talon zippers”. Most of the Filson affectionados today desire bags with Talon zippers because they were really smooth, and the zipper teeth were no joke, very little, if any, of zipper failure. If you have a bag with Talon zippers, it for sure was manufactured in the 90s. Later in the 2000s filson switched over to YKK branded zippers. YKK zippers were also solid, they’re a well known zipper company based in Japan. They continued with these zippers to about 2010. Around that time Filson the company was sold to Bedrock Manufacturing, a company that also owns Fossil and Shinola Detroit. Since the 2010s Filson started using their own branded “Filson” zippers which likely were just YKK zippers. In my experience, they worked just as well. 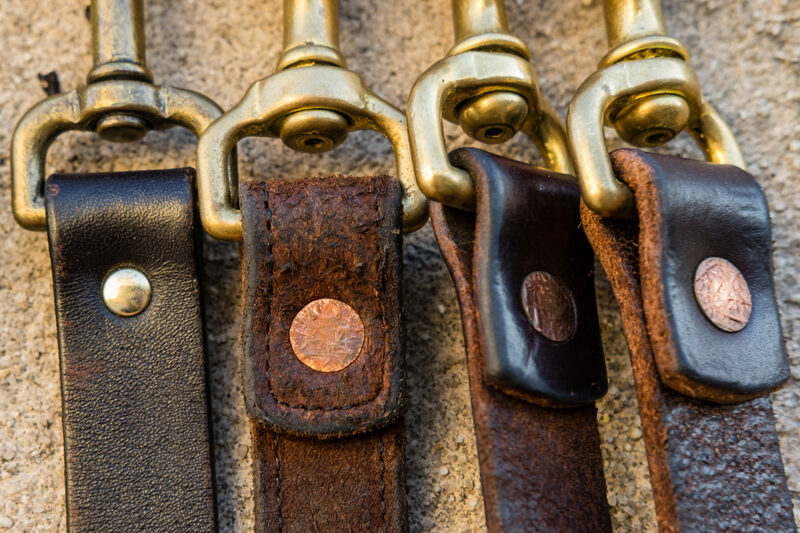 However, the major changes in quality over the years was most prominent in the bridle leather used and not so much the zippers and twill canvas. 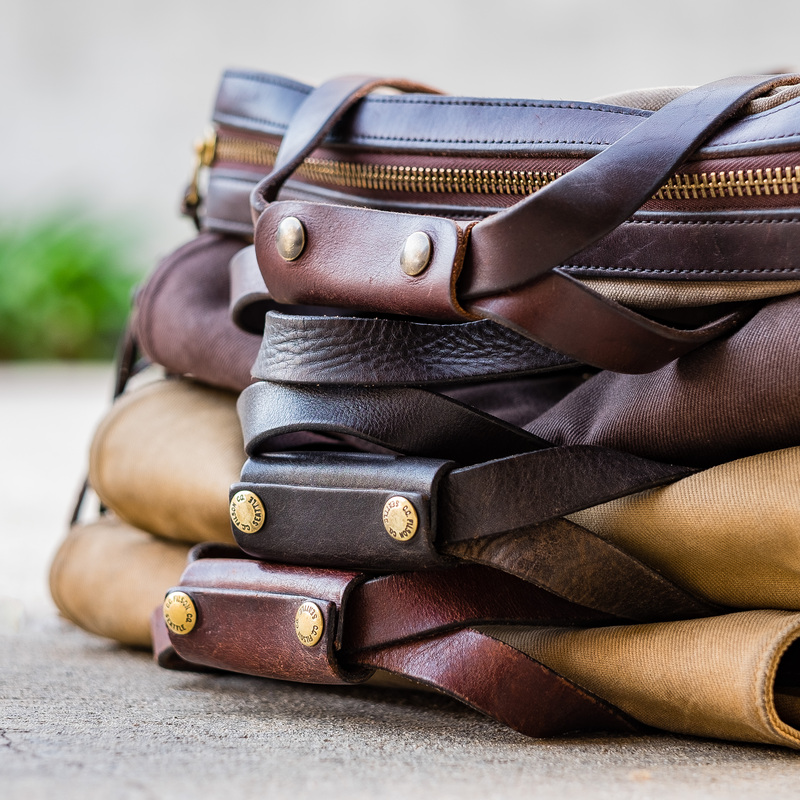 If you had a Talon era bag and Filson era bag (today’s) and compared the leather, the Talon bag’s leather was significantly better in quality. The Talon leather aged to a lightened chestnut color, was thicker, and also felt robust in weight. The recent Filson “bridle leather” doesn’t feel like leather, cracks more easily, and the backside is typically unfinished and fuzzy. The current leather feels more like “foam” and not leather. The leather also wrinkles very easily in an unattractive manner and does not lighten with color over time. All of this information I learned much later after I had owned a few more Filson bags. Filson bags are still ‘buy it for life’ bags because they still have a lifetime guarantee regardless of when/who you purchased it from. When you send the bag in for repair, they will either repair it or replace it with a brand new same bag if they deem it not worth the repairs (time/cost of repairing that bag outceeds the time/cost of producing a new bag). 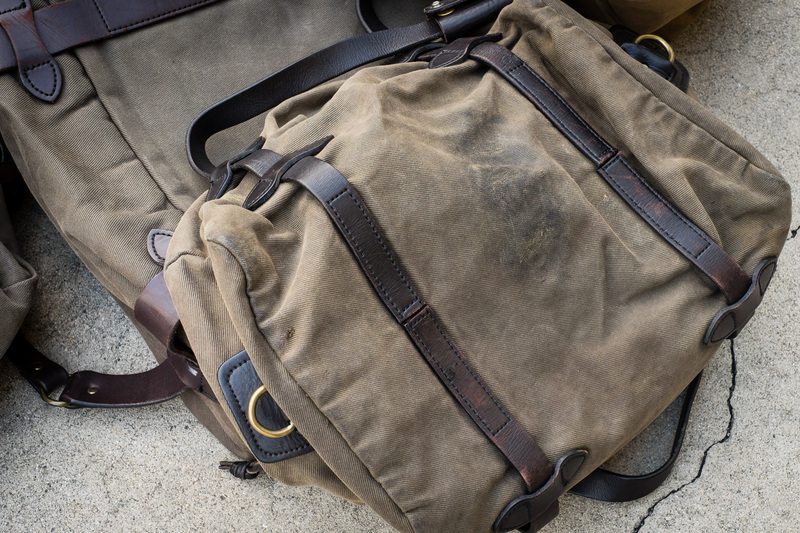 The only situation of a Filson garment/bag that is not under lifetime warranty is items purchased from a Filson outlet. These bags are indicated with a “X” on top of the Filson logo, and Filson will literally not touch these garments/bags, and will send it right back to you. So back to my Filson 261 Otter Green tote, I’ll now talk about the design. There are 4 large outer pockets with 2 of them on the functioning as water bottle pockets. Each of them are large enough to fit my 32oz Hydro Flask. Other uses include an umbrella, sunglasses case. The two longer pockets are great for papers/documents, quick access things. In one of these pockets there’s a small key clip on the inside. I don’t find it useful because it’s too short.